Wellington Street West is known for its eclectic mix of stores and restaurants, and also for its impressive collection of old and new buildings. Luckily many of the original structures on Wellington Street still exist, most having gone through a series of modifications and re-purposing. Which I think makes the strip all the more interesting. You can find banks converted to upscale restaurants, houses converted to small shops, restaurants converted to bike shops, a beer store that's now a fresh produce store, and even a funeral home converted to a bagel shop. Each building on Wellington has a unique story to tell. 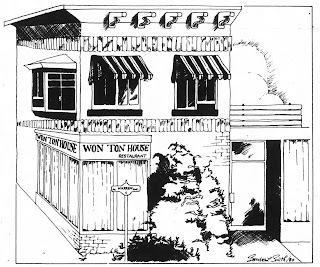 One of the most interesting is the Won Ton House building at the corner of Warren. This building has been transformed multiple times, and has seen a lot of excitement, a lot of history, come through its doors. So I am excited to share the history of 1300 Wellington Street West today! 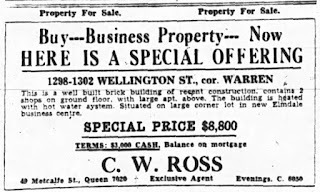 The lot on which Won Ton House now stands was purchased by William Burke at the big Wellington Village lots auction held by the Ottawa Land Association in May of 1919. Burke attended the sale led by a professional auctioneer from Chicago, in a big tent erected at the corner of Holland and Wellington. When the bidding ended for lot 2845 at the corner of Wellington and Warren, Burke held the winning bid at $750. He paid $243.50 down, and mortgaged the rest from the Land Association. He also picked up two other lots on Harmer Avenue near Byron, but sold them within a few years without building on them. William Burke had come to Ottawa at the age of 19 from Chelsea. He entered the lumber business and eventually rose to the position of superintendent with the Shepherd and Morse Lumber Company of Ottawa, where he also at one point in time lost an arm on the job. He knew he was close to retirement from the mill, and may have had a longer-term plan to open a store on developing Wellington Street, in the new neighbourhood that would soon be known as Elmdale. 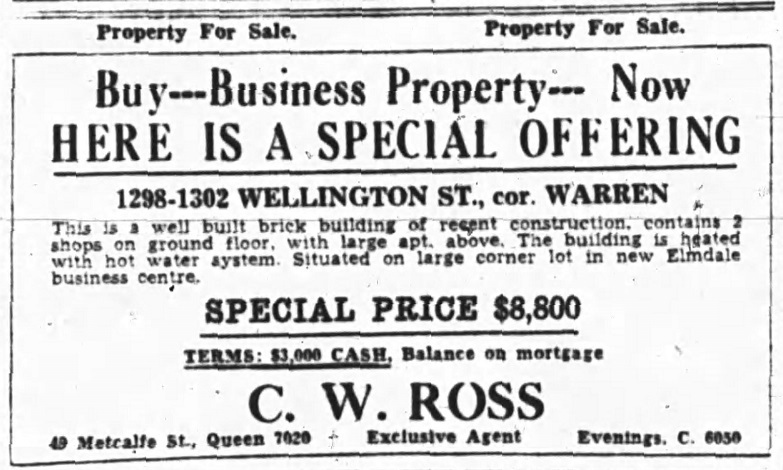 Burke waited a few years to build, and it appears he retired around this time, taking out a mortgage in May of 1922 for $4,000 towards construction of his new building. The building permit had been taken out in late 1921, and some construction had commenced that winter. 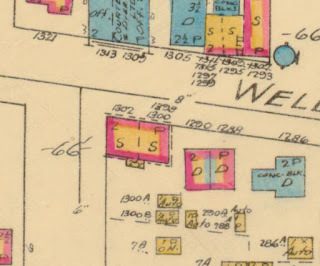 Evidence of this early work was captured in the early 1922 fire insurance plan made by the Goad Fire Insurance Company, who included a little yellow square on their map, representing the 2-storey building "under construction". plans may have been for the building to front onto Warren. By mid-1922, the building was complete. It included two storefronts on the main floor, and a large apartment upstairs. Over time, the upstairs would be modified a few times, alternating between residential, office space, and mixed. 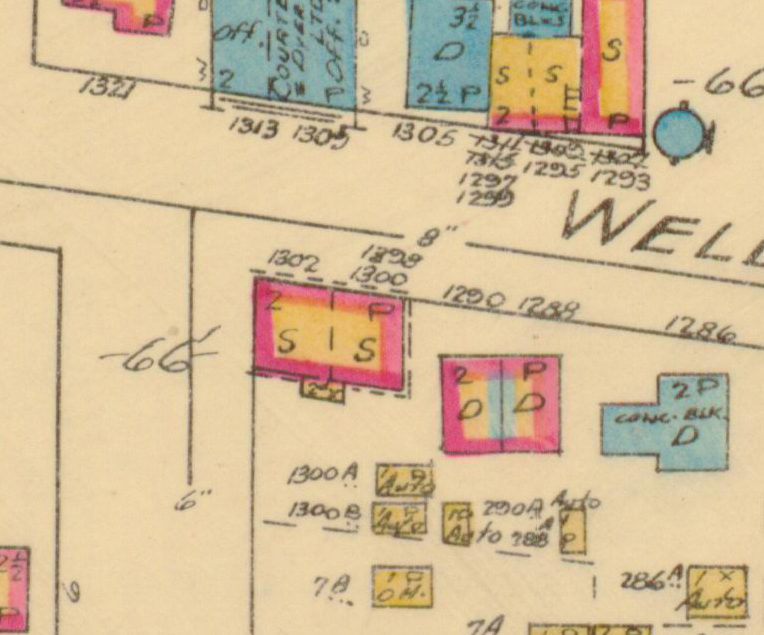 For the first 57 years, the upstairs apartment was numbered 1300 Wellington, while the two stores had numbers 1298 (for the store on the east corner) and 1302 (for the storefront at the west corner). 1298 consisted of about 1/3 of the main floor, while 1302 was 2/3 (probably equivalent to the split that exists today between dining rooms of the Won Ton House). Initially Burke occupied the full main floor with his grocery store. Though he stayed in business here until 1935 or 1936, very little can be found on the store. Burke did not advertise, and I could not track down any descendants. 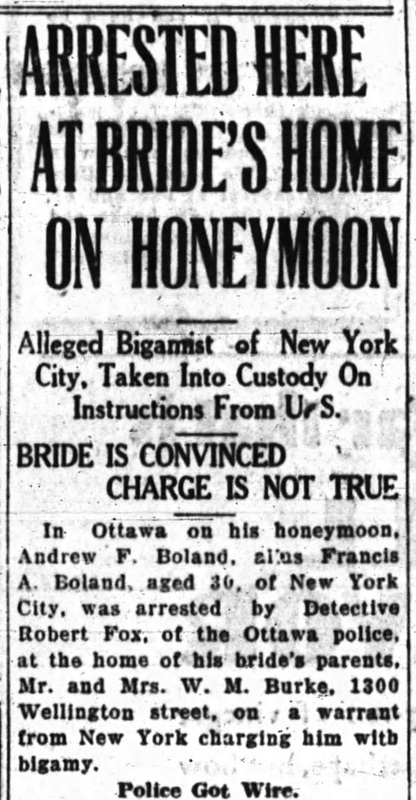 Perhaps the most exciting thing to occur during this period was in July of 1927, when police from Ottawa and New York State joined forces to arrest Burke's daughter Cecilia's new husband Andrew Bolland, who was staying in the house while the couple were on their honeymoon. 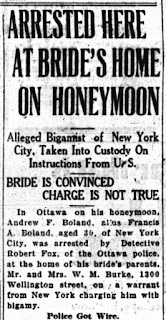 A warrant for Bolland's arrest had been put out on a charge of bigamy - turns out his other wife was quite interested in seeing him brought back to New York! He claimed that his first wife, who had been a secret from his new wife and her family, was supposed to have obtained the divorce, but evidently had not. He returned to New York to stand trial, but his marriage to Cecilia would work itself out one way or another, as the nurse and her husband remained together. Journal article, July 22, 1927. Burke found a tenant for the #1298 Wellington portion of the building in druggist Joseph N. Harmer, commencing in 1923 or early 1924. By 1927, the population of Elmdale had grown significantly, to the point where it was decided that a Post Office was needed for the neighbourhood. Thus, Ottawa Sub No. 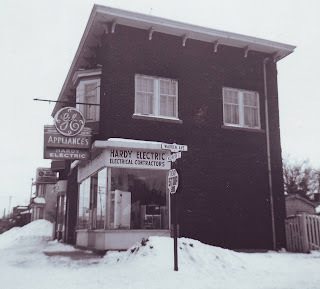 19 was opened on April 29th, 1927 in Harmer's drug store at 1298 Wellington Street, the first post office for the community, with Harmer serving as the inaugural Postmaster. 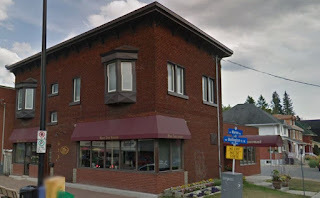 About a year later, Harmer moved his shop (and the post office) to 1307 Wellington, the location where he remained for nearly twenty years, until he died on the job in November of 1945. After Harmer's departure in 1928, William Burke decided to open a confectionery store, which he ran alongside his grocery store at #1298 until 1935. 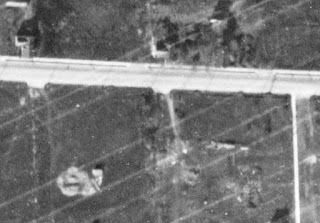 Aerial photo from May 5, 1933 showing Burke's building. During his years of ownership, Burke took out a succession of increasing mortgages against the property, reaching a peak of $8,000 by 1935 (double what he had paid to construct the building in 1922). It is evident that the struggling economy and the depression of the early 1930s hurt him tremendously. A last-ditched effort to buy time to outlast the depression came in April of 1935, when he took out an additional $1,500 mortgage from his unmarried daughter Miss Mary Margaret Burke, who was employed as a civil servant. However, just a few months later, on August 1st, 1935, Burke declared bankruptcy, with debts owing to the Huron and Erie Mortgage Corporation ($8,232), his daughter Mary ($1,500), three distributors (about $1,600), plus liens against the property totaling $397. 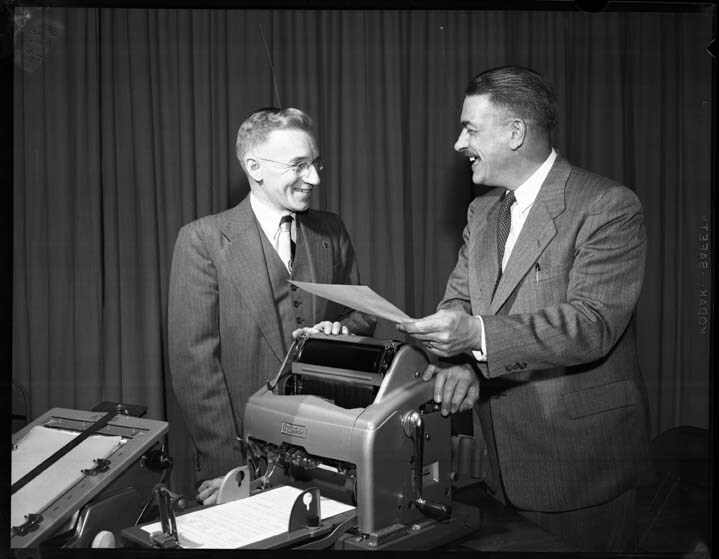 A meeting of creditors was held on August 14th, with T. Bert Cole appointed as Custodian of the Bankruptcy. Cole helped negotiate a deal whereby Mary Burke paid the creditors a total of $250 against their $1,600 owed, and agreed to take over the $8,000 mortgage from Huron and Erie, in order to take over ownership of the property. Four years later, in November of 1939, Mary would eventually surrender the property to Huron and Erie, unable to keep up with the family debts. It was a sad ending for William Burke, who had a long and proud career in Ottawa, though his lasting legacy may indeed be the great brick building he constructed at the corner Wellington and Warren. Burke closed his store and got out of business completely. He and his wife Margaret continued to reside upstairs, but he would no longer put effort into the business. Mary Burke hired real estate agent C.W. Ross to promote the stores, which were available for the rental price of $75 per month. the building available for lease at $75 per month. St. George's Church used the storefront briefly to host a "Bazaar-Tombola" from the 16th to the 21st of September of 1935, featuring "games, fancy work, home cooking booths", and the highlight draw being a $50 bond given away each night as a prize. But otherwise, no tenants were found immediately, and by December, Burke had Ross selling he building as a whole. Asking price was $8,800. However, the economy was still very poor, and the real estate market was practically at a standstill. In 1936, a tenant was found in the smaller shop at 1298, a C. Haikas who ran a confectionery for about two years before he too closed up shop. Meanwhile the larger store at 1302 remained vacant. 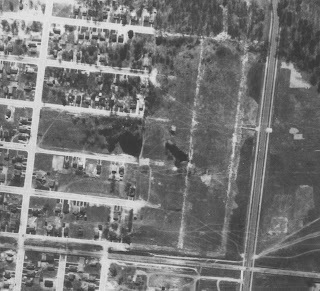 On October 5th, 1936, the City of Ottawa approved Bylaw #8294, for the widening of Wellington Street from Huron Avenue to the western city limits (Western Avenue) to 75 feet. This meant that 10 feet of the Burke property fronting Wellington Street was expropriated, basically right up to the front of the building. This can be best seen in the 1933 aerial photo above, where there is a noticeable distance between the building and the sidewalk. This distance would have been eaten up by the 1936 expropriation. In late 1937 or early 1938, young Eric James Carver (1913-1997) opened his first drug store business as a tenant at 1302 Wellington Street. He would remain in business here for ten years. Of course the Carver's name still remains in Wellington Village nearly 80 years later. On November 9th, 1939, Huron and Erie, the mortgage-holders on the lot, were transferred ownership of the property from Mary Burke, due to the large debt owing on the building she couldn't sell. With WWII commencing as well, it was a hopeless scenario for Miss Burke. Huron and Erie maintained ownership of the lot through the war years. The Burkes moved out of the upstairs apartment late in 1939, and were replaced by W. Kingsley and Frances Moreland. 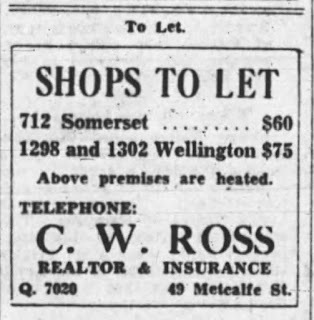 It was convenient for the Morelands, as they also opened a flower shop in the small store downstairs at 1298 (Moreland's Flower Shop). They would last less than two years however, as the business failed and the couple moved out by 1941. 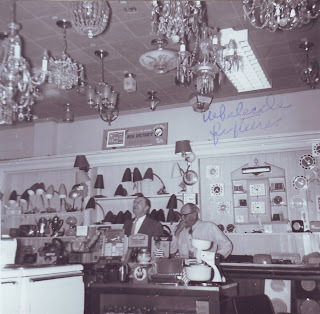 The store was briefly replaced by Brown's Better Flowers in 1941, but it too was short-lived. Carver married Dorothy Helen Rosser on April 21st, 1940, and within a year the couple moved in to the empty residence upstairs. 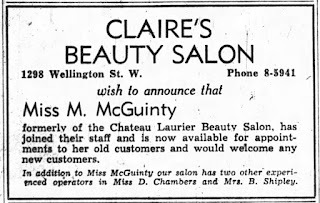 In 1942 they expanded business by opening Carver's Beauty Salon in the 1298 portion, which remained open until August of 1947. The Carvers now occupied the entire building. 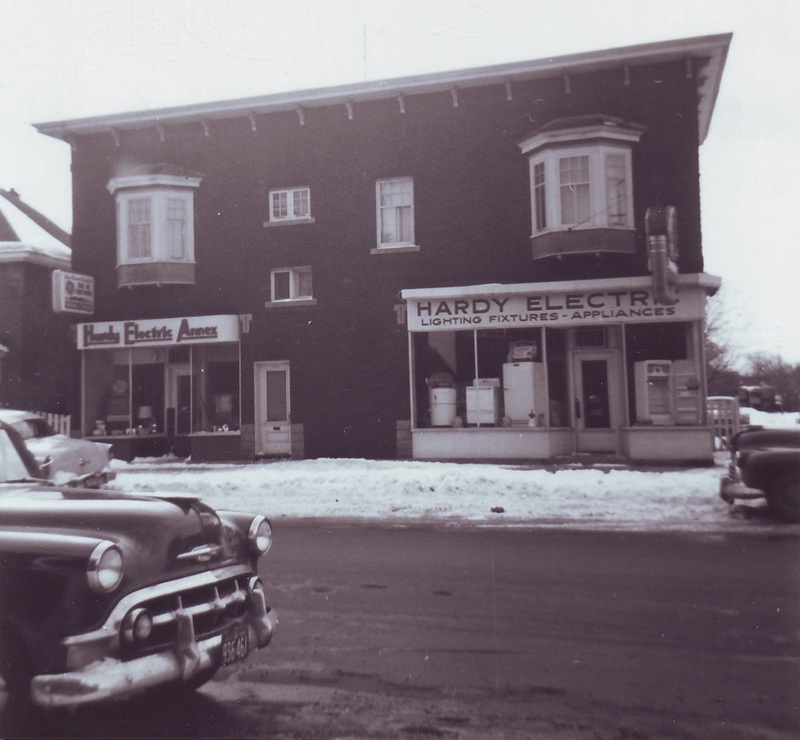 In September of 1946, the Carvers purchased the building from Huron & Erie. At the same time, construction was also underway just a block away at 1314 Wellington (now Parma Ravioli), a building which Carver was constructing to house his drug store for the long haul. Indeed his store would remain at #1314 until the 1990s. He moved his store into the new building in December of 1946, so it is odd he would have purchased the old building while all this was going on. After moving operations to the next block, Carver filled his old spot with a tenant, a small, but fast-growing company, Hardy Electric. 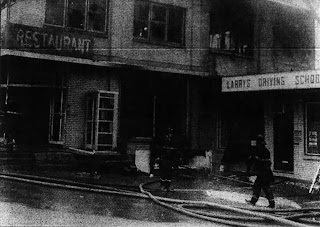 Shortly before 7 a.m. the morning of Saturday December 14th, 1946, a large fire struck the three garages located behind the store (built side by side), which faced onto Warren. The southernmost was destroyed, which had contained a large amount of display material. 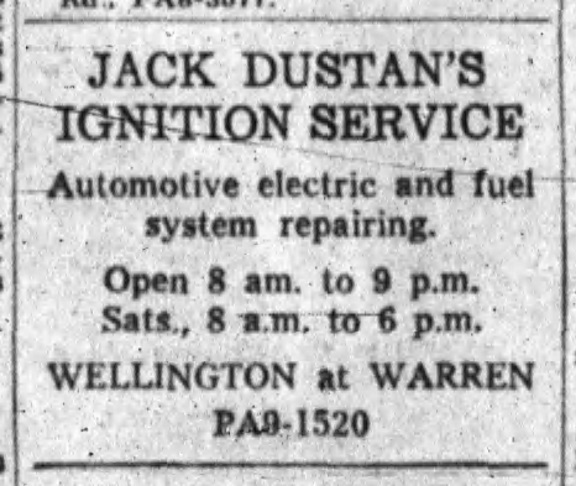 Incidentally, on that very same day as the fire, an advertisement appeared in the newspaper promoting the opening of a new shop at 1302 Wellington Street, Hardy Electric. 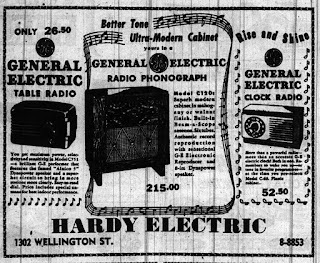 Hardy Electric was established by Gavin Hardy a few years earlier. He had spent years working with his electrician father, and worked as a small contractor doing house wiring, and later got into selling fixtures. Gavin and his wife Muriel owned the house at 37 Western Avenue, from which Gavin ran his business from between 1940 and 1946. They even converted the large garage at the back as a display room for fixtures. Looking to expand operations, Gavin found the former Carver's drug store available close-by. 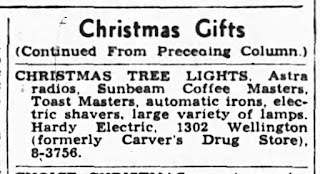 Ad from the Ottawa Journal - December 21, 1946. On February 1st, 1947, Gavin A. Hardy was granted a 10-year lease at $100 per month rent for the space at 1302 Wellington, by Carver. 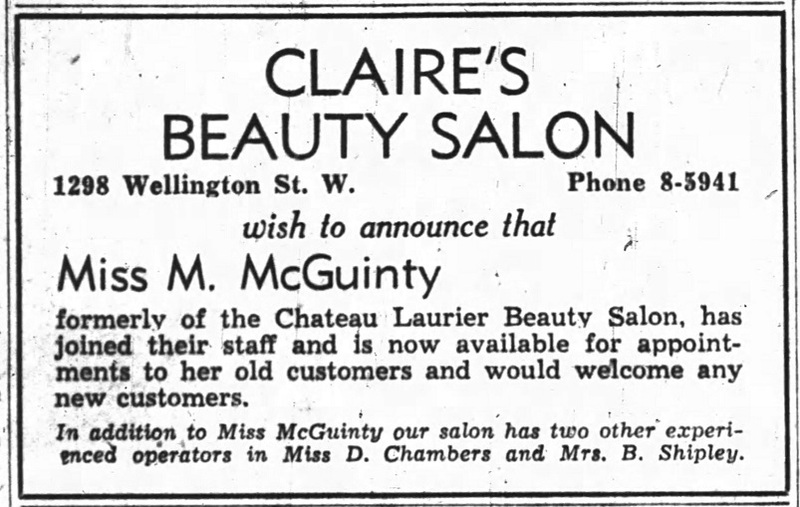 Meanwhile, Carver's Beauty Salon continued to operate at #1298 until mid-1947, when it was taken over by Claire's Beauty Salon. On June 18th, 1947, Hardy was surprised to discover that Carver was interested in selling the building, and so he gathered up all the money he could access in order to purchase it, which he did. 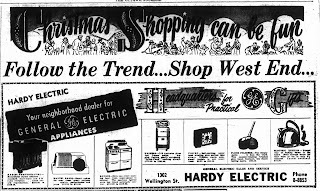 He allowed Claire's to remain in the building for another year or so, but by late 1948 or early 1949 had increased the Hardy Electric storefront to the entirety of the main floor by creating what was called the "Annex" at 1298. Hardy Electric obtained the General Electric oil burner franchise in 1947, which Gavin Hardy considered his big break. They began installing one oil burner per day, 100 in the first 100 days, at a time when obtaining oil burners and even oil was difficult. 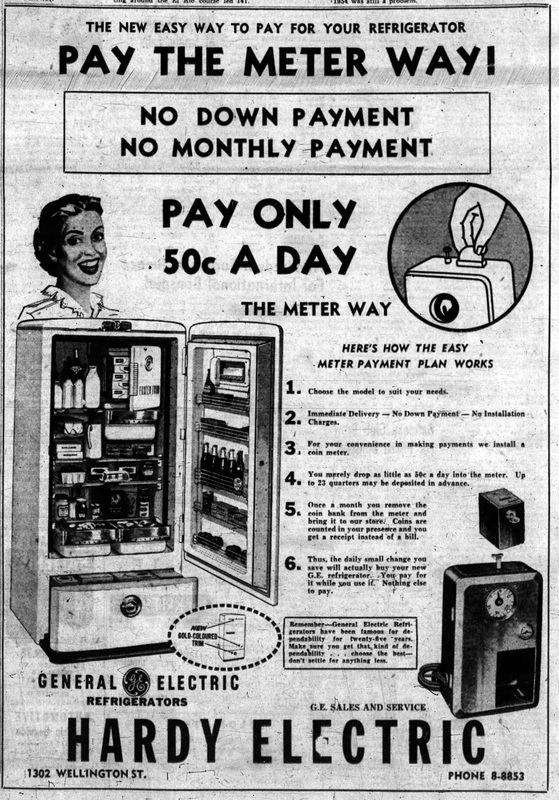 They moved on to large appliances, while still offering house and business wiring services. 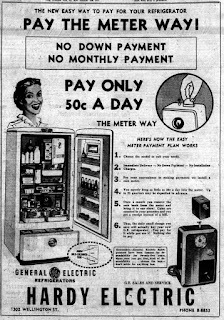 Some of the ads that follow below also show the development of technology through the exciting period of the late 1940s and early 1950s. 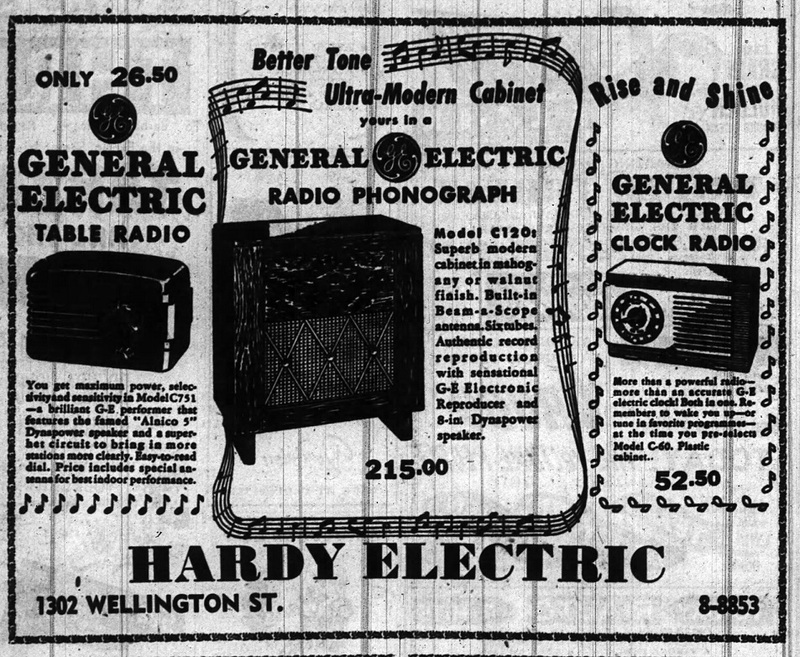 Hardy Electric began the place to purchase these items for the Wellington Village area. store to empty! Kind of a funny concept! 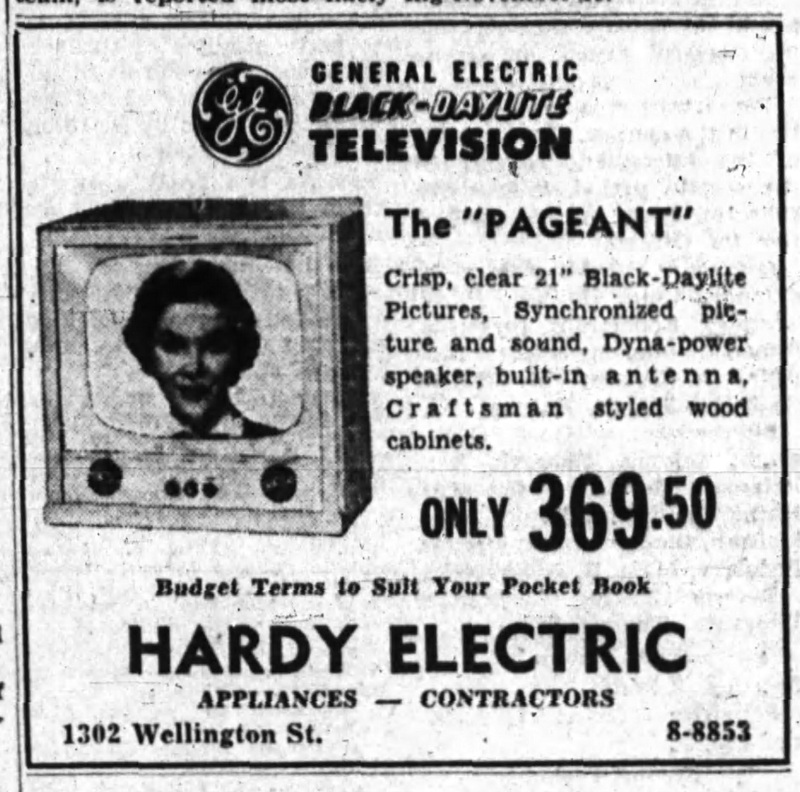 The introduction of the television set to the general public was a significant milestone in the development of technology. 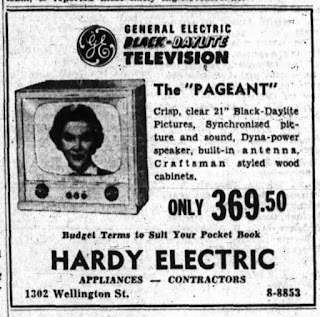 The earliest ad I could find with Hardy offering TVs is shown below. Keep in mind, $369 in 1953, when converted through the Bank of Canada's inflation calculator, is the equivalent of $3,419 today. Amazing! These incredible photographs below are all thanks to Mrs. Anne Gillissie, daughter of Gavin Hardy, who so kindly shared some of the contents of her family albums. These photos I would estimate to be from 1955, and show the building from various angles an impressive 61 years ago! A side view, looking east from the middle of Warren. available for sale. Gavin Hardy is at left in the photo. that exists today would not come until 1979, by the way. 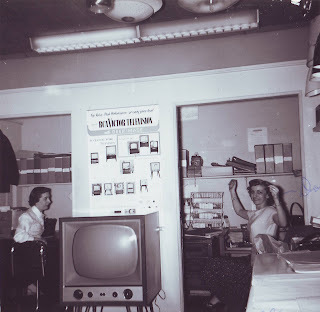 A photo of the upstairs office of Hardy Electric. 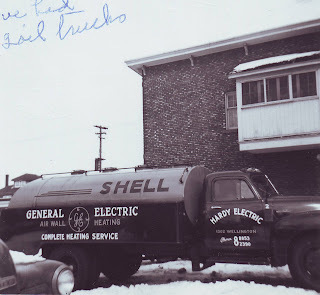 An article on Hardy Electric published in the May 1955 issue of Electrical Contractor of Canada noted that the company had done a million dollar's worth of business over the last three years. He attributed his success to his great amount of promotion the company did. 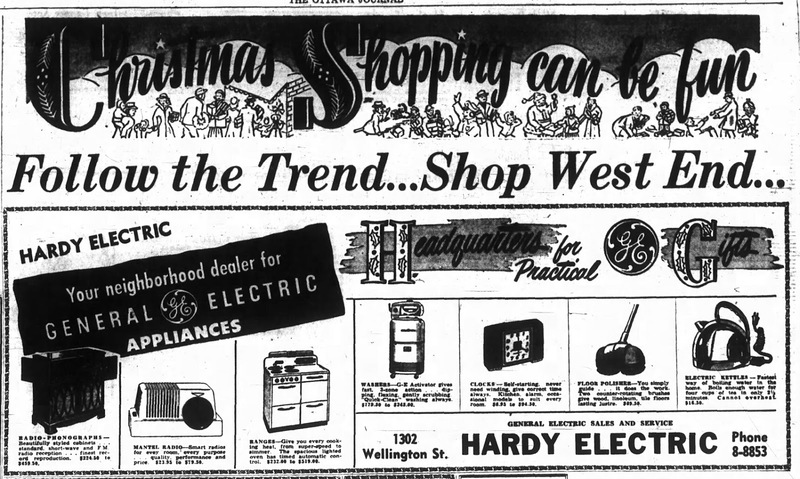 Along with the regular newspaper ads, Hardy also was the sponsor of "the Singing Thermometer" program on CFRA radio, "brought to you by Hardy Electric, the West Ottawa electrical firm that services the famous name appliances it sells. ", four mornings a week. 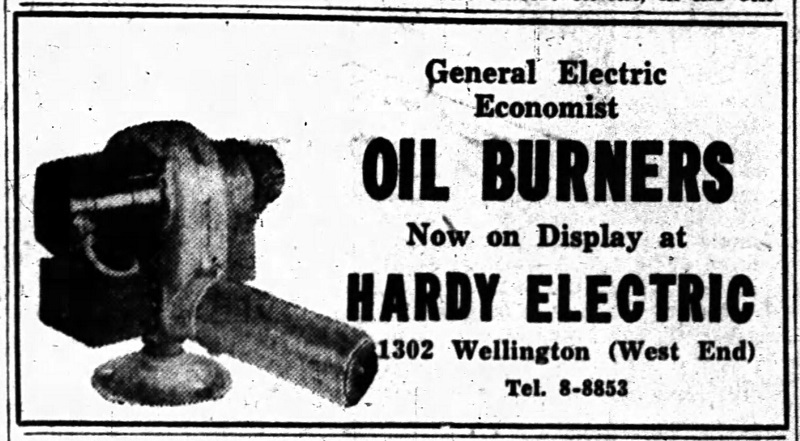 Hardy would not advertise his electrical contracting business (which comprised 80% of his work), but instead focused on promoting oil burners, TVs and appliances. 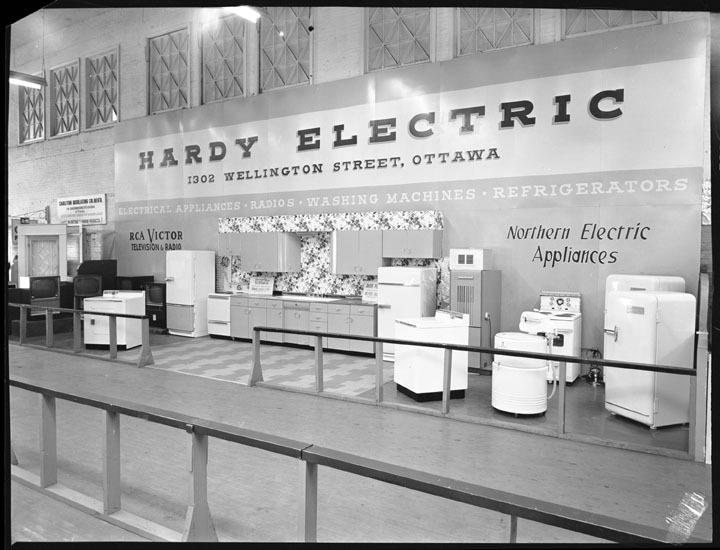 He also regularly set up a 40-foot stand at the Ottawa Ex each summer, which displayed full kitchen set-ups, and demonstrated how the appliances worked. He kept the store front modest intentionally, arguing "if you put on an expensive front, the customer gets the idea that you don't need the business and goes elsewhere. We like to remain humble but neat." 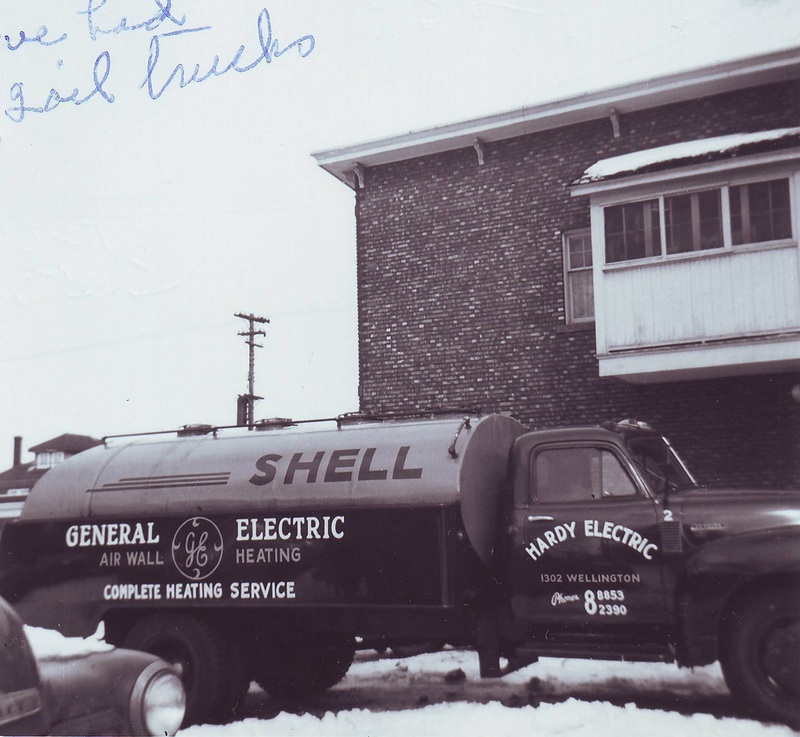 By mid-1955, Hardy Electric had a fleet of 11 vehicles, and had designed plans for a 50-by-35 foot addition that was to be built soon at the rear of the building, to provide additional working area and storage space. He had also moved into the home construction and land development business, and had built 30 houses over the previous 30 months. The firm was about to become incorporated, to offer shares to employees. However, tragedy struck on Sunday December 4th, 1955, when Gavin Hardy died suddenly from carbon monoxide poisoning inside his garage at home. Gavin had been attempting to charge the battery on the family's little-used second car by running the motor, something he apparently did fairly regularly. 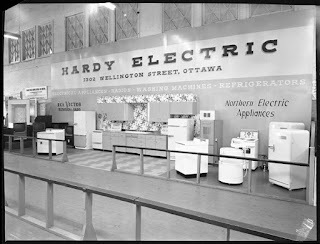 Hardy was only 42 years old, and aside from being president of Hardy Electric, was also a prominent member of Kingsway United Church, and was a charter member and former vice-president of the Ottawa Lions Club. Hardy's devastated widow and two young children had little choice but to make the difficult decision to close the business. 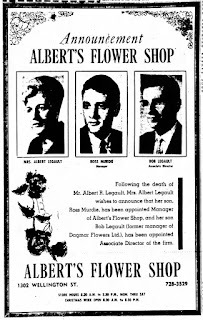 On April 27th, 1956, Gavin Hardy's widow Muriel sold the building to florist Albert Romeo Legault. 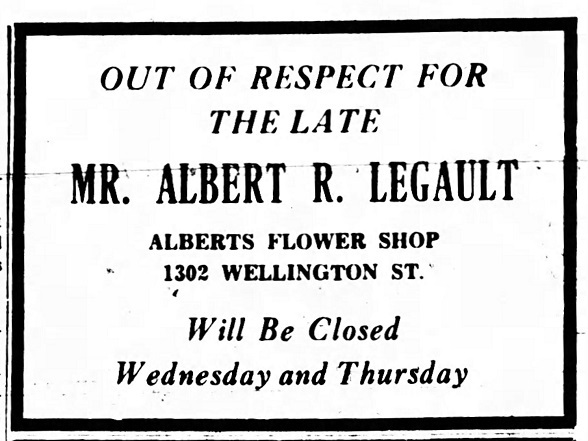 The Legault family operated Albert's Flowers a little east at 1218 Wellington, at the corner of Hinton (the building is now Anthony's Pizza), and they continued to do so at that time. The upstairs apartment was put up for lease as office space, along with the smaller offices. 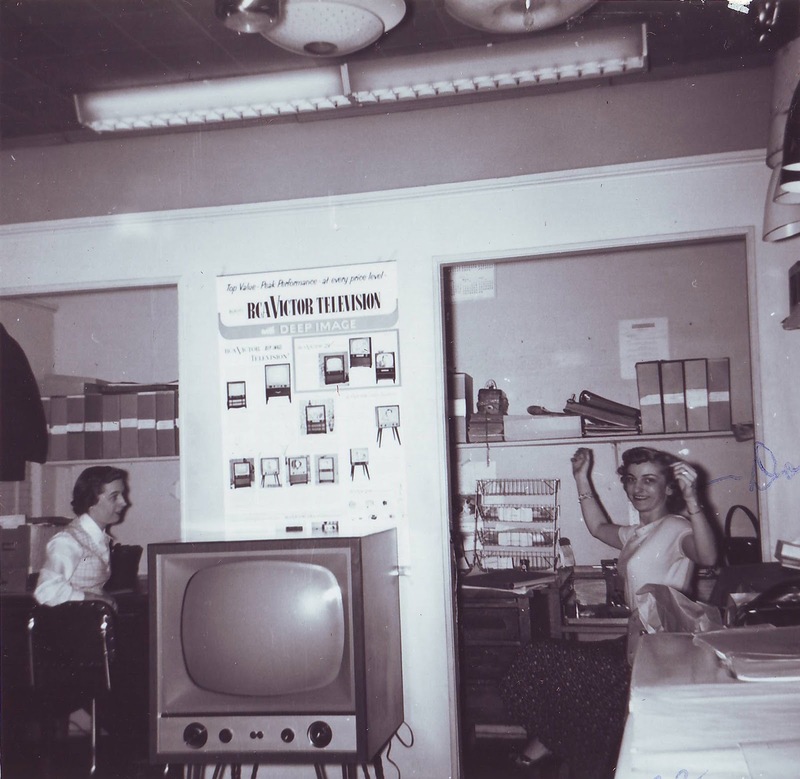 The upstairs was rented in late 1956 by Federal Electronics Regd, a TV dealer, who would remain in the large office space upstairs until 1962. 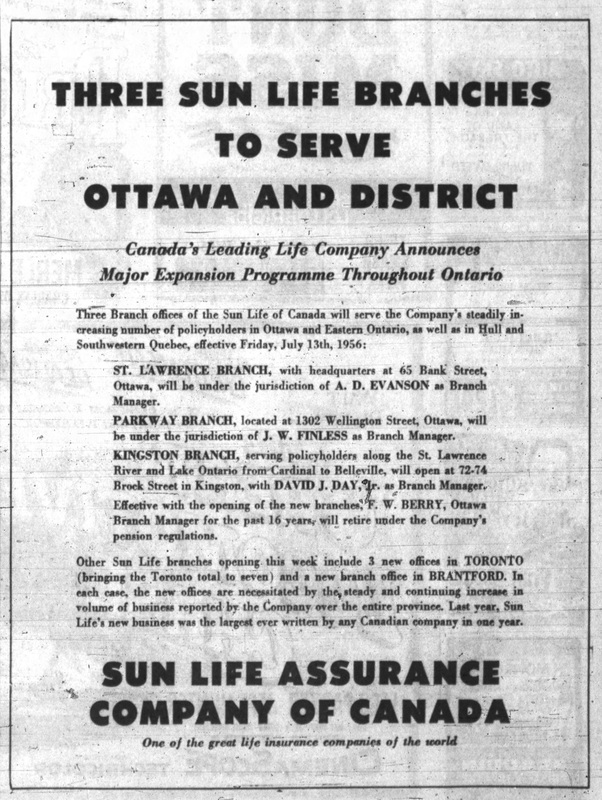 The large storefront on the main floor was rented out to the Sun Life Assurance Company, who opened their "Parkway Branch" at 1302 Wellington Street. The smaller storefront on the main floor (1298) appears to have remained predominantly vacant until 1962. 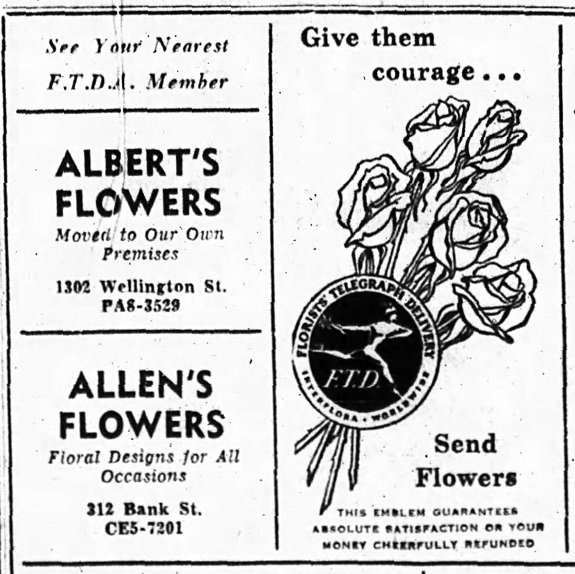 Albert's Flowers relocated in to 1302 Wellington Street in November of 1957, proudly announcing in their regular advertisement on November 26th that they had "moved to our own premises". On March 19th, 1963, Dennie Legault, son of Albert Legault, 9 years old, was hit by a car at the corner of Wellington and Clarendon, suffering severe head injuries and internal injuries. 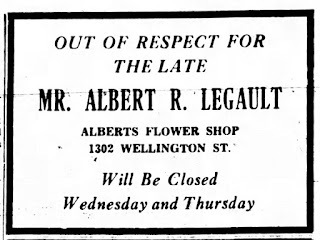 On November 30th, 1965, Albert Legault passed away at age 53. Ownership of the building was transferred into the names of his widow Rita and son Robert. The Legault family announced within a few weeks that the flower shop would continue operations, and that her other son Ross Murdie would take over management of the store. A large ad in the newspaper was taken out to let residents know that the store would live on. 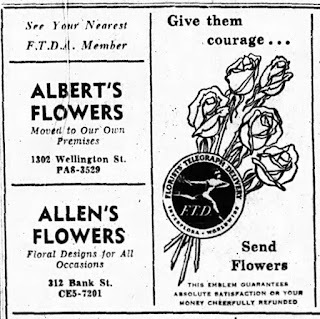 During the 1960s and 1970s, Albert's Flowers remained in business at 1302 Wellington Street. 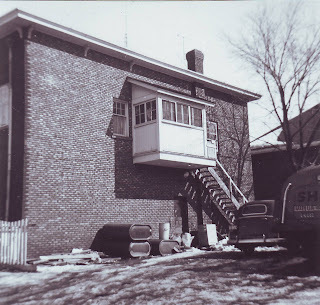 The Legaults had moved upstairs into what was turned back into a residential apartment in 1963, and here Mrs. Legault remained until the mid-70s. 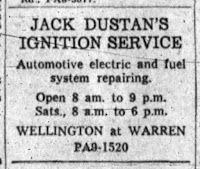 Other highlights during this period included when Jack Dustan Ignition Service was opened out of the rear parking lot (and I assume the old garages) in 1958 for a brief time. 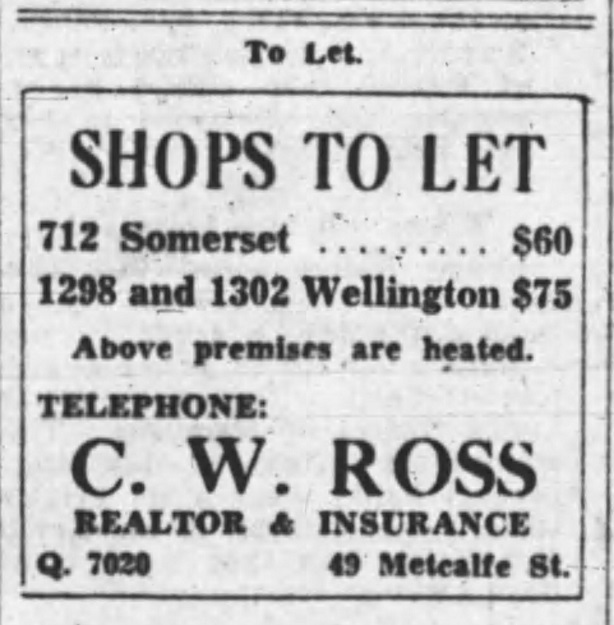 Meanwhile the smaller storefront at 1298 Wellington saw a revolving door of various businesses: Canadian Paint Sales (1963), Albert's Wool (1964-65), Scheepjers Knitting Centre (1966), Embury Variety Store (1968), Mother Hubbard's Variety Shop (1969-1973), and Albert's Lunch & Variety (operated by Albert Monsour, 1975-1979). Albert's Flowers moved to Hampton Park Plaza by 1979. On August 29th, 1979, the Legaults sold the building to restaurateur Nelson Tang. 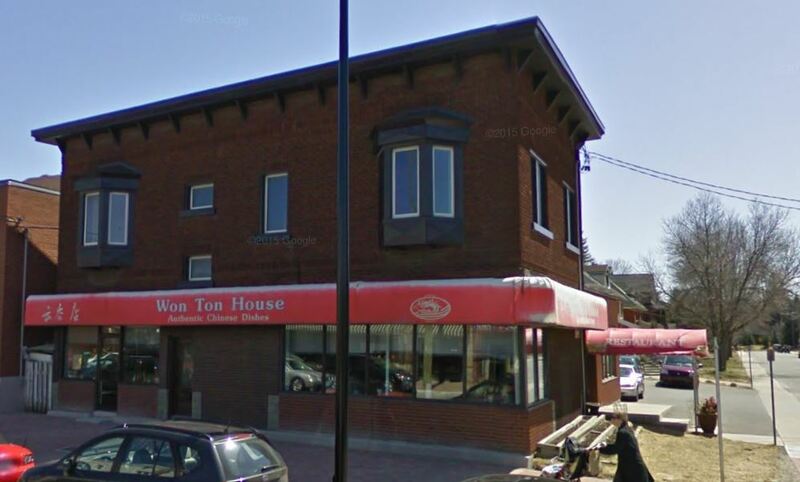 Nelson Tang, along with his wife Winnie, had opened the Won Ton House in 1974 in a different location - in a strip mall called the 'Parkway Plaza' at 733 Richmond Road near the foot of Rowanwood Avenue (where the big glass-fronted 5ish-storey condo building now stands today). Nelson had come to Canada five years earlier, and had been a chef at La Paloma restaurant prior to opening the first Won Ton House. 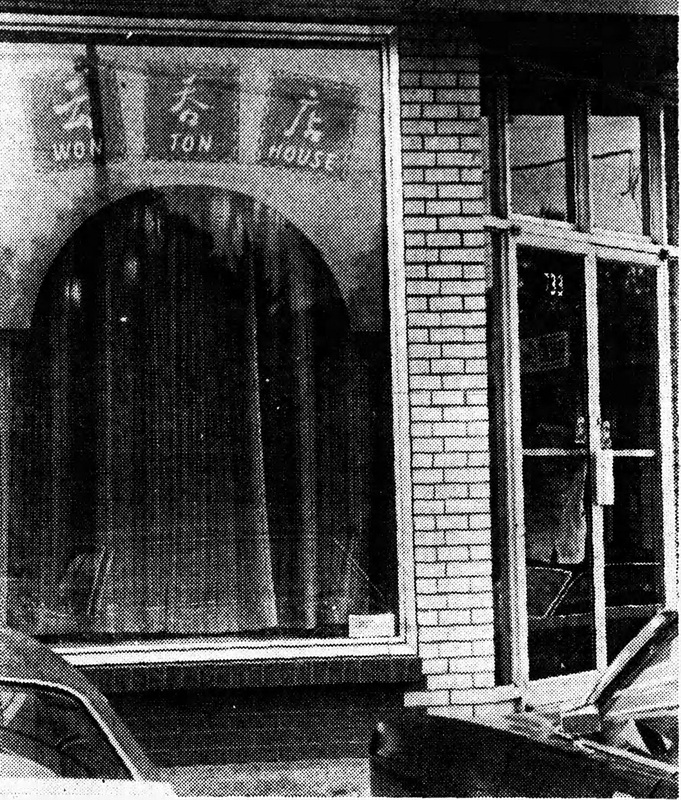 The Won Ton House was considered unique for Ottawa in that it served the food of northern China (unlike almost all of the others of the era which served strictly Cantonese dishes). The Won Ton House began life with almost a cult following - it's somewhat isolated location kept it small, they did not have a liquor licence and took no credit. The restaurant was very popular among it's loyal patrons due to its high quality food (an interview with Tang in 1975 noted that he would buy fresh meat and vegetables every day in small quantities, and would not cut them until they were about to be cooked), the uniqueness of the offerings, the pleasant service, and other small touches such as home-made menus featuring Chinese characters (which was apparently uncommon in the early days of Chinese restaurants). However an early-morning fire on the morning of Sunday April 22nd, 1979 destroyed the entire building, including the original Won Ton House restaurant. Undeterred, the Tang family found a new location through a vacancy that existed at 1300 Wellington Street, and purchased the building in August of 1979. The building was renovated significantly, and the rear addition was added, to create a private party room, and additional seating. 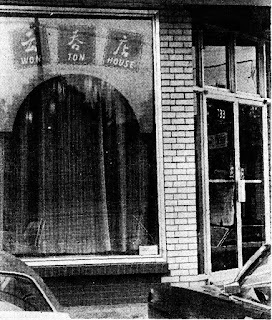 On the afternoon of June 18th, 1980, the Won Ton House had a grand opening party, and that evening opened for business for the first time at their new location, 1300 Wellington Street. The Won Ton House reopened to long lines every night. A reviewer in July noted that they waited over half an hour on a Friday evening for a table. They were now licensed, and accepted credit cards. Their hours of operation in 1980 were Monday to Wednesday noon to 12:30 a.m., Thursday through Saturday noon to 1:30 a.m., and then on Sunday from from noon to 10 p.m.
Nelson Tang passed away in 2004, but his much-loved restaurant continues on today, operated by his family. 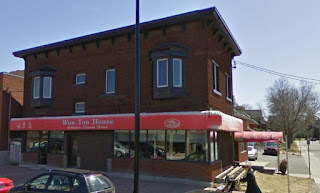 The Won Ton House is nearing 40 years at their location on Wellington Street, and the building itself nearing 100 years. What an exciting past it has had, and so important to the community through the years - landmark druggist, the first post office, the first place to buy a TV, and now one of the city's longest running restaurants. Such a storied past, so closely linked to the history of Wellington Village - and worth mentioning, the best Chinese food in Ottawa! 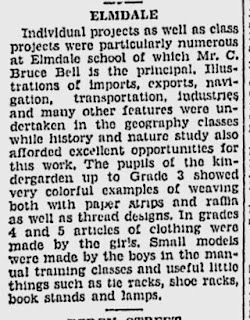 The story of Elmdale School begins in May of 1919. The Wellington Village neighbourhood was literally days away from transitioning from a farm into a residential district. 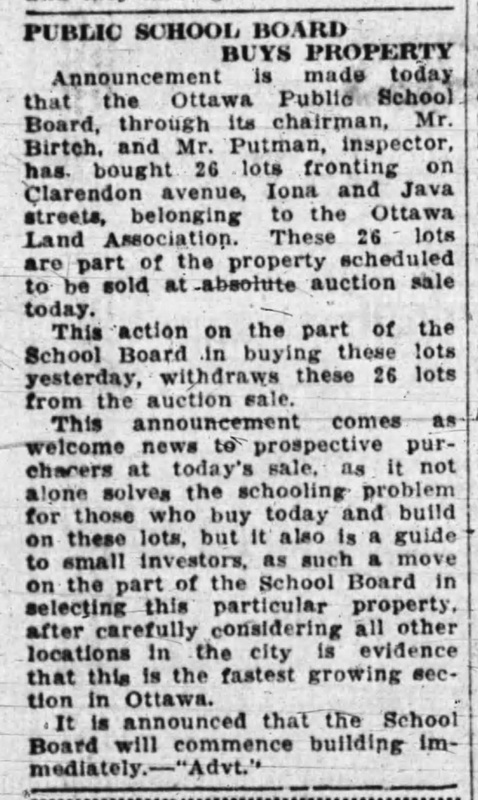 The Ottawa Land Association, who had acquired the farmland 25 years earlier and sat on it as an investment, was about to sell off the lots to take advantage of the prosperity and optimism associated with the end of WWI. 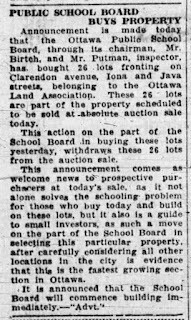 I wrote about the OLA's big auction previously (https://kitchissippi.com/2015/04/17/history-of-wellington-village-ottawa/), and just one day before the auction, a strategic deal was made whereby the Ottawa public school board agreed, smartly, to acquire a full block of lots in the OLA subdivision 26 lots in all, for the price of $6,450. This was a total of 621 feet fronting Java and Iona, and a depth of 200 feet, a total of just less than 3 acres of land. Clarendon of course was the eastern border, while the western border was a spot a less than 200 feet from Mayfair Avenue - the western city limits. If you've ever wanted to know where the border between the city limits and Nepean Township used to exist, you can use the western end of the school grounds as the marker - everything past the schoolyard was Nepean until 1950. The purchase was strategic both for the Board, and for the OLA, who used the timing of the sale to highlight the coming infrastructure to those potential auction buyers. The board meanwhile did not immediately make plans to build. The project for them was naturally long-term, once the population had filled in. With Connaught on the east and Hilson on the west, there was no urgency to construct a school until the population numbers required it. 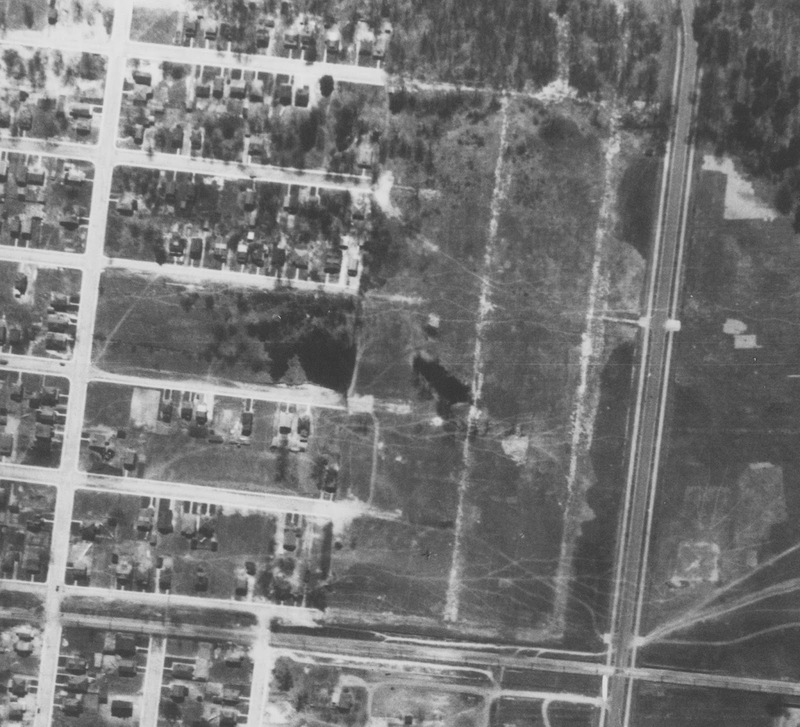 The name 'Elmdale' was first born in December of 1922, when the small but growing number of property owners and residents of the area got together to form a community association. In a meeting held on Monday December 18th, 1922 at the Rosemount Library, the association was formed. A constitution was drawn up and formally adopted along with several bylaws, its first President was elected (Mr. Harry Schroeder), and a name was chosen by the group: the Elmdale Municipal Association. This group proudly continues on today as the Wellington Village Community Association, by the way! The name 'Elmdale' was selected because of the large number of of elm trees in the area, which of course you can see from the various aerial photos of the era. 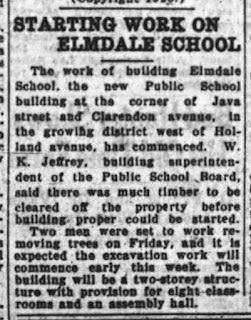 The Journal wrote in 1947 that Elmdale derived its name "from the abundant and attractive tree growth prevalent on the school grounds." 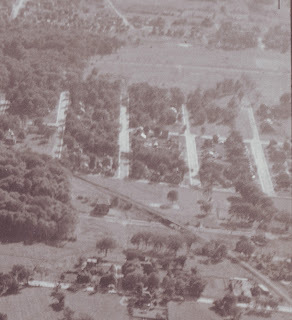 The Association began to push for the construction of a school as early as February 1923, in a meeting with the local school trustee Armstrong. They were briefly put off, before formally meeting with the school board in the fall of 1923, to push for the construction of a two-room school on the board's property. By December, the push was for a more sensible eight-room schoolhouse. The board put off all talk on the school until the numbers could merit it. Furthermore, the board refused to consider construction on any new school owing to its finances. 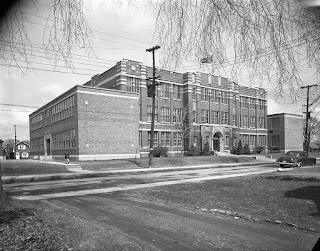 A deal with the Ottawa Collegiate Institute Board (then a separate entity, managing the secondary schools of Ottawa) whereby Kent Street Public School was to be purchased by the OCIB fell through, leading to a refusal to hear arguments for the construction of a new school in the west end into 1927. It was in 1927 that the subject caught fire, thanks to the local residents. Almost all of the residents of the area now known as Wellington Village met at a community meeting to discuss the topic. A canvass made at the same time showed that there were already 357 school-aged children residing in the area and attending neighbouring schools, plus an additional 85 others of kindergarten age who did not attend school due to the distance they would have to travel each day. On top of this, the area was still growing substantially (at best, only half of the lots in the district had been built on by this time). A group of over 100 residents appeared in front of the school board's Management Committee in February to push for the new school. They were represented by W.C. Graham of the Central Council of Municipal Associations, Secretary L. Howard of the Elmdale MA, as well as Aldermen J.A. Forward and Sam Crooks (who had first campaigned on the guarantee of getting the residents a school). To help their cause, parents pointed out that mass over-crowding was caused at Connaught school, with class sizes reaching up to 46 pupils, where students were forced to each their lunch sitting on class-room floors, and attend makeshift classrooms in the basement. The overcrowding also led to greater sharing of illness, leaving Connaught with the second-poorest attendance figures in the city. 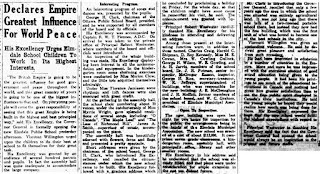 The Board came out days later with an announcement that the residents would get their school, but that it would be a "two-unit portable education institution which can be readily moved about from place to place...complete with heating fixtures, plumbing and other accessories of a modern school", and was to be "of an easily dismantled nature." Each unit would hold one-class of 45 pupils, providing a total space for 90 students. The idea was put forth by Senior School Inspector Dr. J.H. Putman, who he himself had written in a report in 1922 that a school would be required by 1926. Not surprisingly, the local residents were up in arms about the proposal. Once again an even larger group attended the School Board meeting on March 3rd to oppose the proposal, and demand the immediate construction of a permanent, eight-room school, to be ready for occupancy by September. An association member, Mrs. Munroe noted that the proposed portable school was "more suited for construction in Confederation year than in Jubilee year." 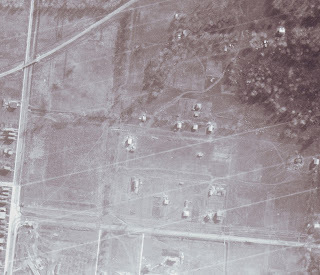 It can be further pointed out that Elmdale at the time was one of the few areas in Ottawa zoned "Class A", ensuring only higher-class homes could be built. Thus a makeshift temporary building was even more inappropriate. Due to the community pressure, the board voted unanimously against the portable school idea, but also could not pass a vote to agree to build a permanent school either. Most vocal against the new construction idea was Trustee W.E. Gowling, chairman of the finance committee, who argued that an associated increase in public school taxes would "lead to a minor riot among taxpayers". The Association continued to press hard, providing more hard figures and Census data to the Board. However in July of 1927, the Board issued their decision to stick with their plan to erect a two-unit portable school. Local residents threatened to acquire an injunction to stop the work if the board proceeded with the plan. Trustee George Clark argued that plans for a full-sized school be made, and at minimum a six-room centre block of the building, allowing for additions, be built right away and ready for occupancy in 1928. Once again W.E. Gowling was quick to close debate, arguing that the matter had been "talked out", and that the board would "wait until there was sufficient money in hand to give Elmdale a school in keeping with the high tone of its new homes." as it awaits construction to begin on its new school. the Queensway running diagonally from bottom right). with no houses, just a large number of trees. It would not be until 1928, when the Board would finally green-light the construction of an eight-roomed school for the Elmdale neighbourhood, which in original plans was to front onto Java. Preliminary plans were prepared by W. K. Jeffrey, superintendent of buildings for the Board, in January, and the approval was given at the Board's finance committee on Friday February 24th. However, the Board stated they had on hand only $46,000 towards the cost estimate of the construction, which was $102,000. Thus the Board went to Ottawa City Council to request $60,000. Initially the City leaned towards issuing a levy on property owners in the area to pay for their own school essentially. However, it appears the City did not go this route, and instead simply gave the money out of their funds. On March 20th (things moved fast back in the day), Ottawa Council approved issuing debentures for $60,000 towards the construction cost. Famous Canadian architect Cecil Burgess was hired at a cost of $2,800 to finalize detailed plans and specifications in March, with the hope that construction could begin by May, with the goal of having the school ready for the fall. The Board immediately then requested tenders for the construction (requesting potential contractors to submit bids for the contract to build the school). But in May the Board tried to press their luck, and voted to try to aim for construction of an 11-roomed school, and to go back to City Council again to ask for $30,000 more, arguing that "a cheaper school might not prove so economical in the long run", that adding additions in a few years would cost more in the long run. 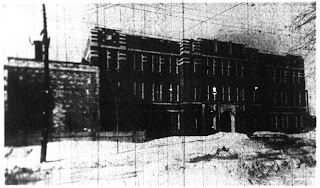 The Board debated heavily with various options being voted and lost, including the idea of building the 11-roomed school, but leaving the top floor unfinished indefinitely, and an even grander idea that the Board dump Devonshire School to the Collegiate Board, transfer all of the equipment and staff to Elmdale, and build an even larger Elmdale. Ultimately, they decided to ask Ottawa for the extra $30k, but it was refused. Finally in June, the Board decided to go ahead with the eight-room school, plus an auditorium. What they did smartly was to build the school such that it would be easy to add additions to it in the near future. Essentially they built a new school knowing that at a future unknown date, it would become the centerpiece of an even larger school. The contract was given to Taylor and Lackey for construction of the school. The company was to be paid $98,500 for the job. An additional $14,200 was paid to the firm of McKinley and Northwood for the plumbing and heating work. Taylor & Lackey was a long-time Ottawa contracting firm operated by Robert Taylor and James Lackey who had completed many large projects in the city dating back to before 1910 (notably the old Nurses' Home at the Civic Hospital on Parkdale, St. Matthew's Church on Glebe near Bank, the old Connaught School addition, the old Westminster Apartments on the south-west corner of Metcalfe and Laurier, among others). trees can be seen on the lot where Elmdale would soon appear. Construction work began with the removal of many trees from the property. This work began on June 8th, 1928, and after a few days, excavation work began. On June 11th, the school board held a special meeting where it appointed the inaugural staff of Elmdale School. 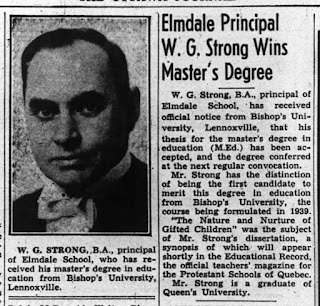 Robert Westwater, one of the top teachers at Kent Street School, was appointed Elmdale's first principal, and also the 'charge' of the grade five pupils. Also named were Miss Myrtle Wright (grade fours), Miss Mary Smith (from Bolton Street School, grade threes), Miss Matilda Baker (grade twos), Miss Bessie Pigott (grade ones), and Miss Marion Clow (from Connaught School, school director, and charge of kindergarden), as well as additional teachers G. Martin, V. A. Graham, A. Rea and Miss Florence Jamieson. Principal Westwater was Scottish-born, and after arriving in Canada in 1913, had gone overseas as part of the war effort from 1914 to 1919 as part of the Canadian Army Medical Corps. He then attended the faculty of Education at Toronto and graduated from the arts program at Queen's. He had been a history and geography teacher at Kent Street. It was also decided that while the residents awaited completion of the building, Elmdale School would have its first classes inside Connaught. To make room, Connaught temporarily moved its grade five and six classes into empty space at Devonshire School. 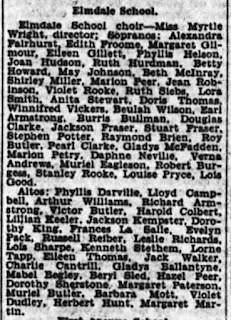 229 students were part of this "Elmdale" group that attended classes at Connaught for the 1928-29 school year, transported by special run Ottawa Electric Company buses. Meanwhile, construction of the new school went through endless delays due to the scarcity of bricklayers, terrible weather conditions and various complications during construction. Initially, it was assumed that the school would be open by January 1st, 1929, but was later pushed through to the spring, and eventually the fall of 1929. November 1928 shot of Elmdale School under construction. is along the left, and Byron can just be seen at bottom). 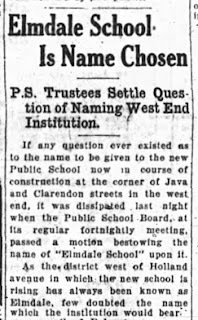 Interestingly, in March of 1929, School Trustees were asked to officially name the school, a step which had not been done yet. No surprise to anyone, the name "Elmdale" was chosen. In March of 1929, the School Board recommended adopting a new type of school, intermediate schools, that were popular in the United States and Britain, to handle children aged 12 to 15, in grades six and seven. Connaught was proposed to be one of the first, taking in all of the grade 6 and 7 students from the Devonshire, Connaught and Elmdale boundary areas. 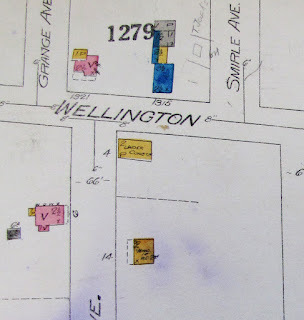 The original Elmdale school boundary, by the way, was Carling Avenue on the south; Hinton Avenue to the CNR (Queensway), then Hamilton Avenue to Wellington, then Holland to the River on the west; the River on the north; and the city limits on the west. In May of 1929, while construction of Elmdale continued to slowly proceed, one of the workers, 36-year-old bricklayer Wilfrid Jubinville of Aylmer, fell 30 feet the the ground after the rope of a scaffold he was working on broke. Just before the rope break, another bricklayer who had been working on the scaffold stepped inside a second storey window. The shift in weight likely caused the rope to give way. The scaffold was of the "swinging type" and was suspended from the roof. Both of Wilfrid's legs were broken, and he sustained other internal injuries. He initially was in critical condition, but survived and lived another 40+ years. Progress continued to be slow and rumours throughout August of 1929 persisted that it would not be ready in time for the start of the school year. 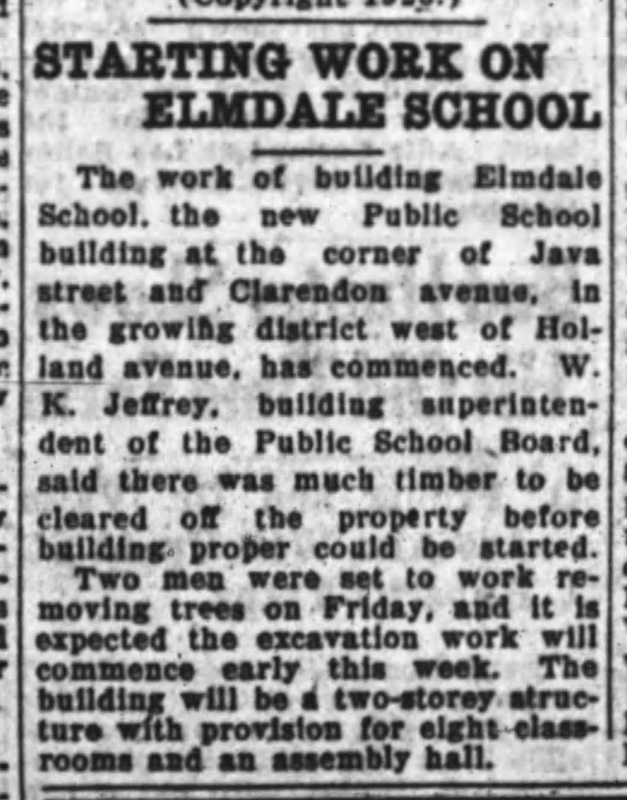 However, Elmdale indeed was opened for its first day of classes on September 3rd, 1929. It opened with a grand total of 333 students in its eight classrooms. 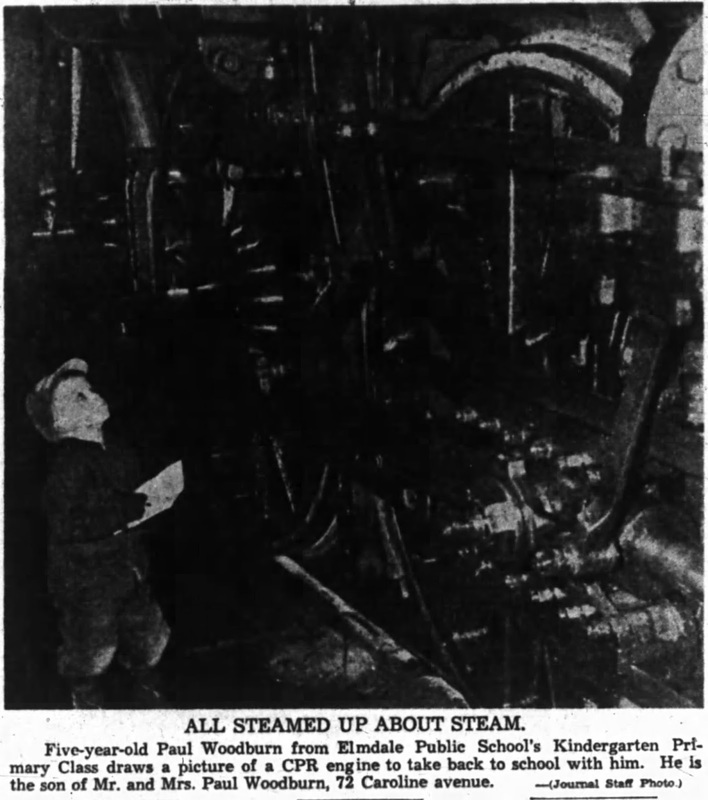 A month after opening, there were complaints that some of the floors had begun to heave, particularly the floor of the assembly hall, immediately above the boiler room. Superintendent W.K. Jeffrey claimed this was due to the the cement under the hardwood floors retaining moisture that had not been visible at the time the floors were laid. Construction was officially finished in the first week of November of 1929, with final payments made to the contractors Taylor and Lackey, and McKinley and Northwood. 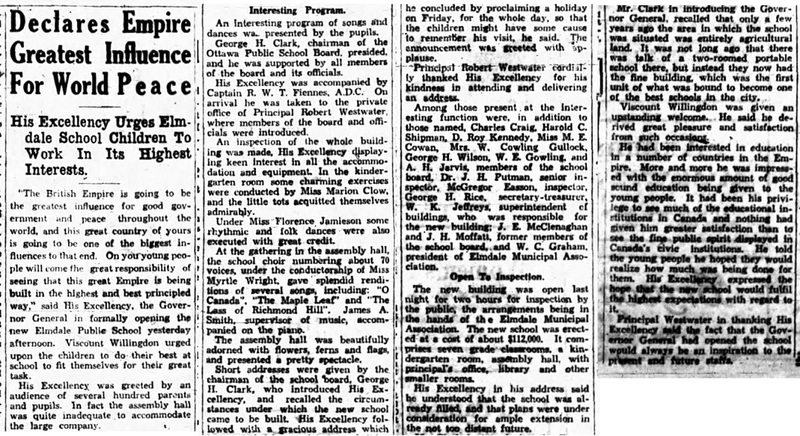 On Tuesday November 19th, 1929, at 3 p.m. the formal opening of Elmdale Public School was held. The event held in the assembly hall, and featured special guests the Governor General Lord Willingdon and his wife the Viscountess Willingdon. Speakers at the event included the Governor General himself, as well as George H. Clark, chairman of the public board, and principal Robert Westwater. There was a children's dance exhibition by the kindergarten children, and the school choir also performed. There was also a bit of controversy over pictures that were to be presented at the gala opening. Trustee W. E. Gowling was prepared to refuse the pictures: "We want to see them first" said Gowling, "We don't want anything which glorifies war." To which a representative of the patriotic women's organization donating the pictures responded: "If you don't want them there are lots of people who do". It was unclear if the pictures were accepted or not. Following the big ceremony, the school was opened to the community that evening for "public inspection". 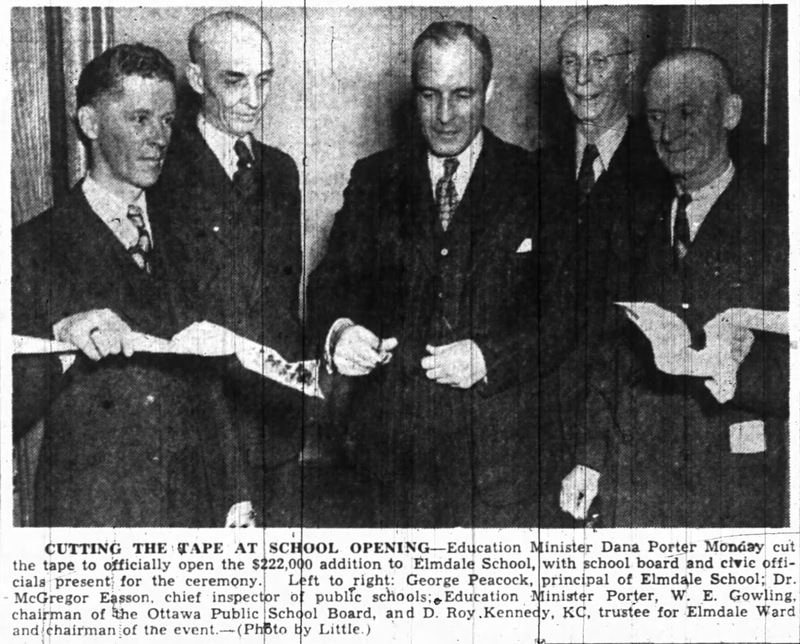 An article detailing the opening ceremony of Elmdale School. 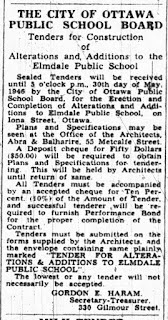 In the spring of 1930, the community association petitioned the school board to request to the City of Ottawa for a sidewalk to be laid on Iona Street next to Elmdale. A contract was also issued by the board that May to Joseph Lecomte for the sodding of the front lawn of Elmdale, for a fee of $150. 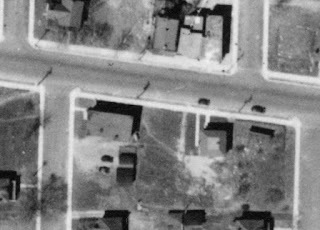 It is interesting to note as well that in the early days of Elmdale, the boys and girls were very much separated from each other. 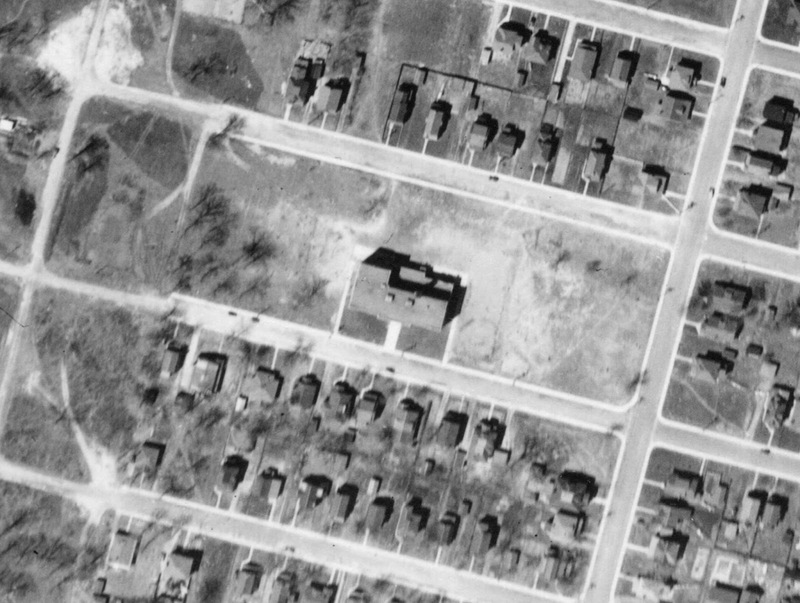 Where we now have junior and senior yards at Elmdale, in the beginning, it was boys' and girls' yards. 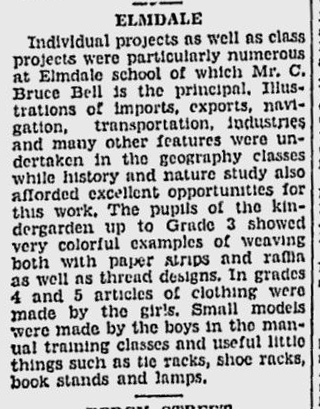 Lois Hunt, an Elmdale student in 1929 was interviewed in 2004 by the Ottawa Citizen, and talked about Elmdale when it was new: "There was nothing but grass, sand and trees in the schoolyard back then. We played a lot of hopscotch and jacks, and we loved to play marbles. They were simple games, really, but we always had fun." Discipline and punishments were stricter than today's students experience, she said. "I'll always remember the time when I was doing some artwork that I was really proud of. The boy in front of me turned around and wiped his hands through it, ruining it. I was so mad and so upset. Of course, I told the teacher, who was also the principal at the time. He took the boy and gave him the strap, which they did in those days. I've never forgotten it because I felt so badly," Mrs. Hunt said. In November of 1930, the school board announced their list of additions and renovations within the board, and noted that Connaught and Elmdale both were projected to require extensions within the next ten years, planting the seed of what everyone knew was soon to come. However, with the economic depression just commencing, no one could have known in early 1930 just how tough times would be over the next twenty years. In fact, due to ceaseless growth, the original auditorium had to be re-purposed into a classroom by the fall of 1930, owing to the increase in school registration. I believe the original auditorium was located on the main floor of the school to the left inside the main front doors where the large kindergarten class now exists. In December of 1930, the Elmdale Municipal Association announced that the association would sponsor a Christmas tree that would be planted on the school grounds, and become a community Christmas tree, to be used annually for the Christmas event, "a tree which would shine in glory every night during the Christmas season by way of carrying out the 'Light Up for Christmas' spirit." 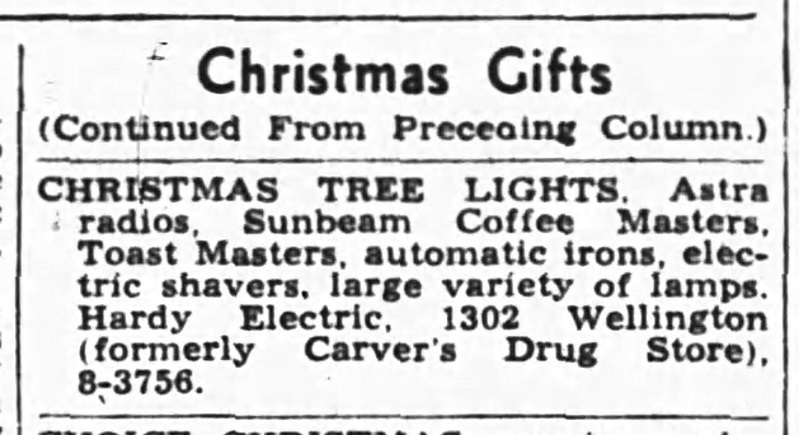 A large, temporary tree would be used in 1930, that was "very pretty, and the effect of multi-colored lights, which can be seen for blocks around is quite in keeping with the festive and joyous Christmas season. Approaching the Elmdale school grounds from the north, one is greeted by the pleasant sight of the large association tree, while forming a distinctive background is the outdoor decorating on the home of F.T. Skinner, 72 Iona Street. Mr. Skinner has strung a series of lights in festoons around the verandah of his home, while the verandah pillars are covered with evergreens." A large, permanent tree was planted in early 1931. By the Spring of 1932, Elmdale still had not selected official school colours. Prior to the annual School Choir Concert held at Glebe Collegiate, material was purchased to make school ties in black and orange, colours which remained Elmdale's official colours for many years. stop suddenly - where the City of Ottawa turns into Nepean! Of significance, the Elmdale Gardens first began in the fall of 1933. They were located to the west of the school, likely around the area where the library and/or play-structure now stands. During the depression and war years, the Gardens acted as an instruction centre for the students of both Elmdale and Connaught, serving as an "object of admiration and inspiration to pupils and residents alike. Vegetable and flower plots, borders and the attractive rock garden are designed and supervised by Miss A. J. Lapp" wrote the Journal. Alida Lapp had been the director of the public school gardens project for the Ottawa board beginning in 1914, up until she retired in 1950. The Gardens were the idea of Dr. J. H. Putnam and Dr. Slemon, who felt that there was a growing need to encourage children to take an interest in gardening, with an increasing number of families residing in apartments or small houses without gardens of their own. The Gardens were fenced in during the spring of 1934 and were a prominent feature of the Elmdale campus through the 1930s and 1940s, however, they were removed at the end of the fall of 1952. (Fast-forward to the present, and the Elmdale School Council has brought back the gardens, at least on a smaller scale, thanks to the efforts of the Healthy Earth Committee - a little plug for my wife Amy here, who is co-chair of the Commitee). The school was used extensively as a community centre for local groups. 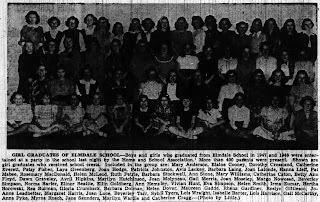 The Elmdale Municipal Association and its Ladies' Auxiliary group were frequent users, and the school was used regularly for Guides and Brownies, Scouts and Cubs, and as a centre for piano and violin instruction. St. Matthias' Sunday School was one of the first external groups to use the school, starting on September 28th, 1930, and it also became the site of Sunday school for Parkdale Church in 1931, and later The Day School Gospel League. Kingsway Church (now Kitchissippi United) was first formed in May of 1947, and they held their services in Elmdale School until 1950. In 1938, grade five and six students began studying French for the first time at Elmdale, taking one class, once per week. Life changed for students by 1940 with the start of WWII. Patriotism came to the forefront and much of the school's efforts turned to the war effort. 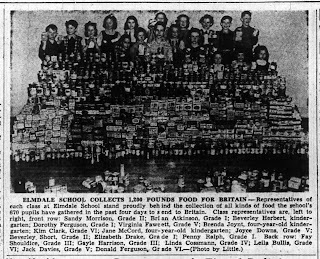 As written by the Journal in 1947: "During war years in particularly, community and school co-operation and pride were evident in the hearty and extensive support of the Canadian Red Cross, Junior Red Cross, Milk for Britain Fund, Aid to China Fund, in collection of salvage, provision of books, magazines and ditty bags for the Armed Services, and in the generous purchases of War Savings Stamps and Certificates." 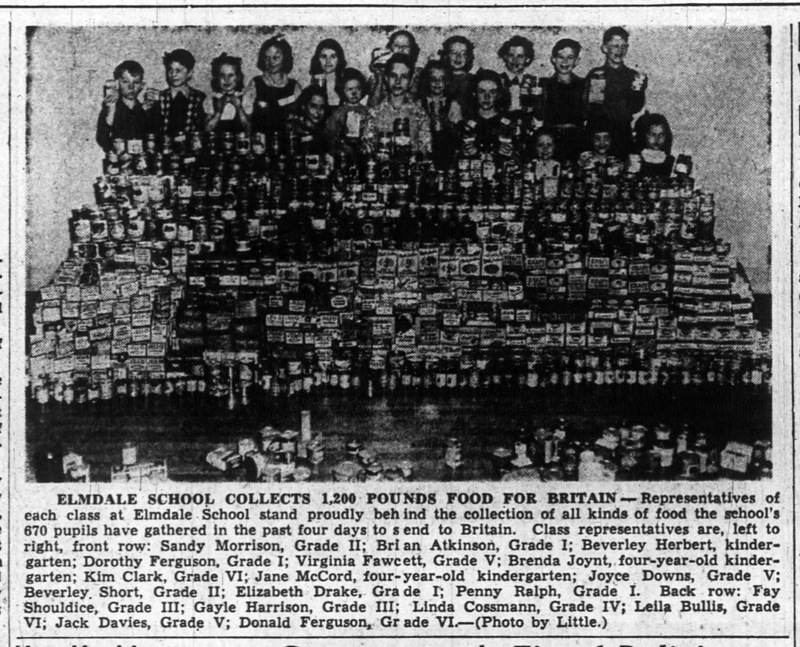 An interesting event involving a student of Elmdale School occurred in 1941. 9-year-old Doreen Collie had come to Canada in the summer of 1940 to stay with relatives for safety, after her city and home were bombed in London, England. 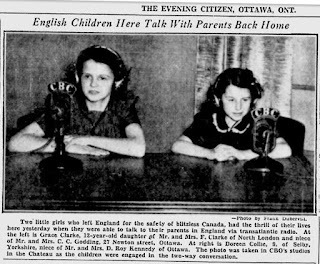 On February 9th, 1941, the CBC, BBC and NBC air the first ever two-way broadcast, featuring Doreen and another girl (12-year-old Grace Clarke) in studio at the CBC's Chateau Laurier studio in Ottawa, speaking live to their parents overseas. Other children in Montreal, Toronto and New York also took part in the special broadcast. 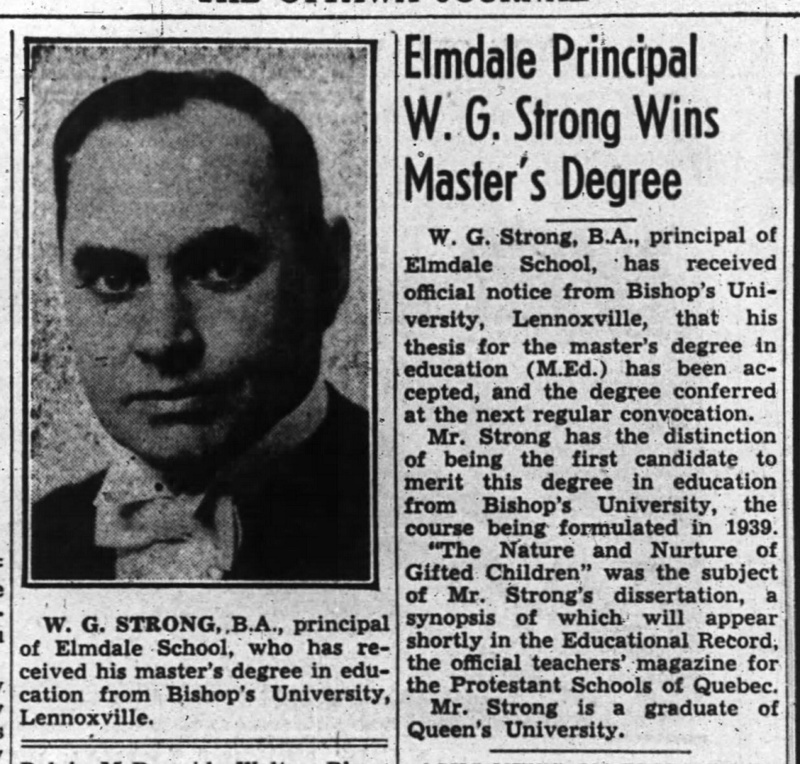 In 1943, Elmdale's principal W.G. Strong became the first ever student to earn a master's degree in education at Bishop's University. Elmdale fell victim to a heinous break-in during a weekend in January of 1944. thieves entered the school through storm windows located inside a sunken window well. Breaking through the window and then forcing open the French windows inside, the thieves then dropped into a coal bin in the basement. They then traveled through the building, crudely forcing open doors and locks as they went, leaving behind a trail of destruction. They entered four classrooms and stole three jars of funds collected for the Red Cross, totaling approximately $2 in pennies and nickels. They did not take any other items from the school. 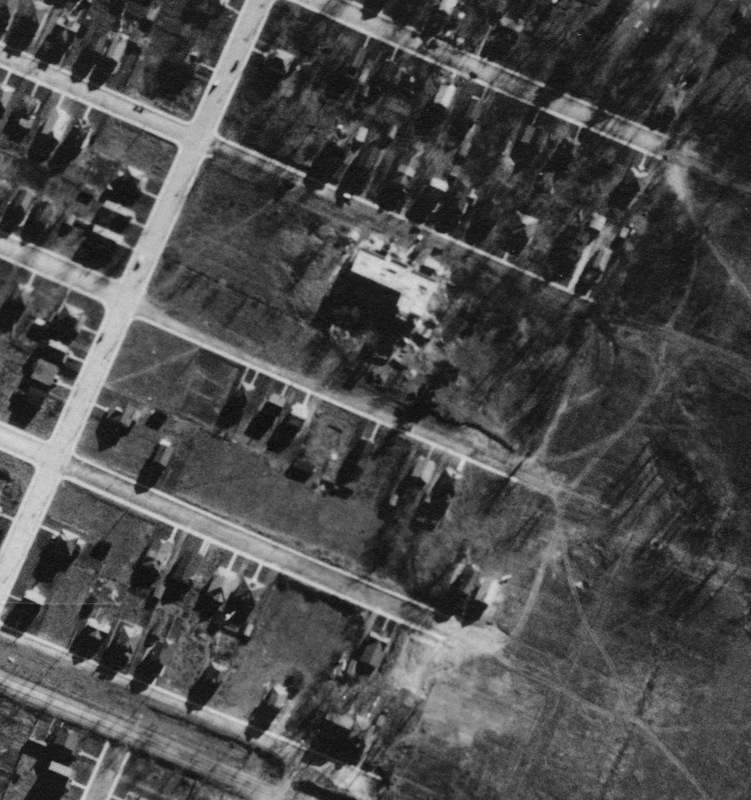 With the end of WWII in sight, it was decided in late 1944 that Elmdale should receive consideration for an addition. A capital expenditures account was established by the board to set aside funds for this project. In October of 1945, it was announced that a nine-room addition was planned for Elmdale, with construction to begin in the summer of 1946. The addition included four classes to be added at the west end of the school, four classes and a large basement at the east end, a large gymnasium-auditorium at the back (Elmdale's first gym), and an activity room on the north side. W. J. Abra was named lead architect for the addition, and came up with the initial plans. A building permit was taken out in July of 1946 in the amount of $188,282. Alex I. Garvock Ltd. was the contractor for the job, with Abra, Balharrie and Shore the architects. 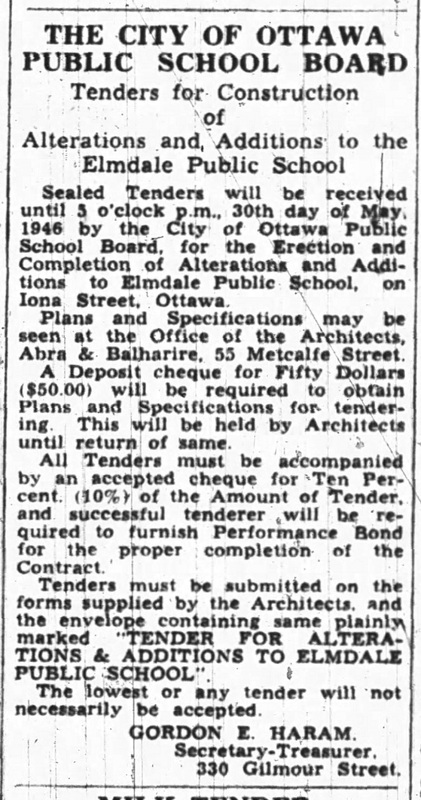 At the time, though nearly 20 years old now, Elmdale was still considered the newest of Ottawa's public schools, on account of the building freeze due to the depression of the 1930s and WWII in the early 1940s. have already begun by this time. 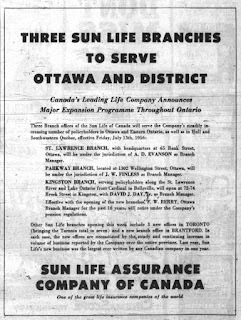 Ottawa Journal, September 3, 1946. 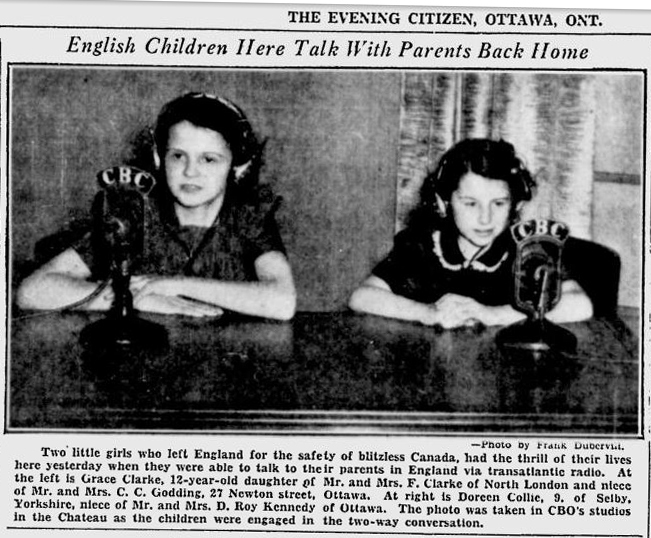 The old newspapers of Ottawa from after WWII are goldmines of information. With the end of the war, paper shortages had ended, and so newspapers increased in size significantly. Also advances in technology allowed for the inclusion of far more photographs. 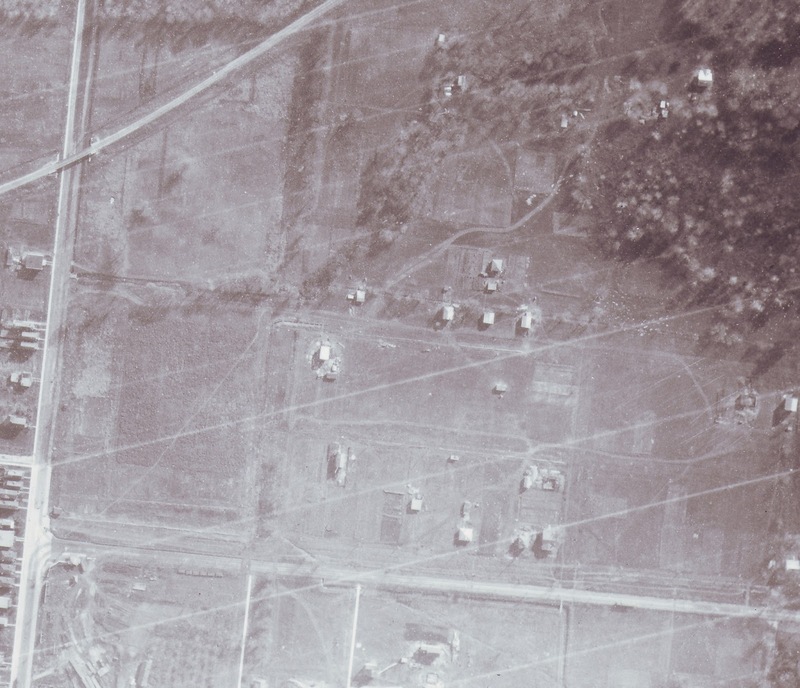 Prior to the war, you might see one or two photos in an issue of the paper. After the war, you would see dozens. Combined with the fact that Ottawa was still kind of a 'small town', and the local news coverage was extensive. 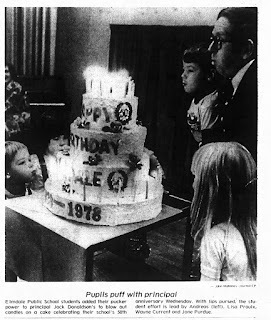 So I've included a few photos of events at Elmdale which featured prominently in the papers of the era. The photo and related article below are from the Elmdale 'Play Day' and sports field day held at Fisher Park on October 4th, 1946. 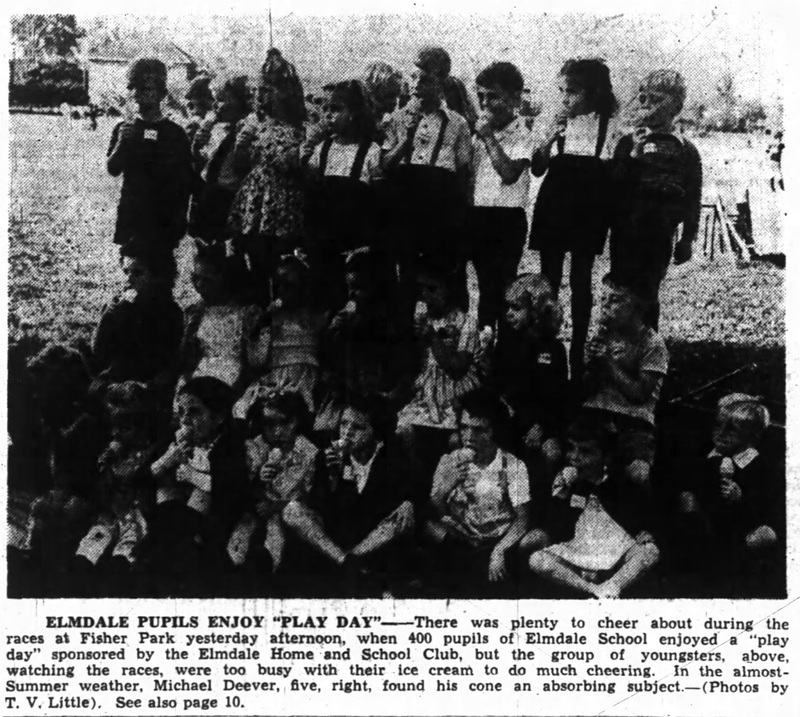 Ottawa Journal, October 5, 1946.
events at Elmdale's Field Day. 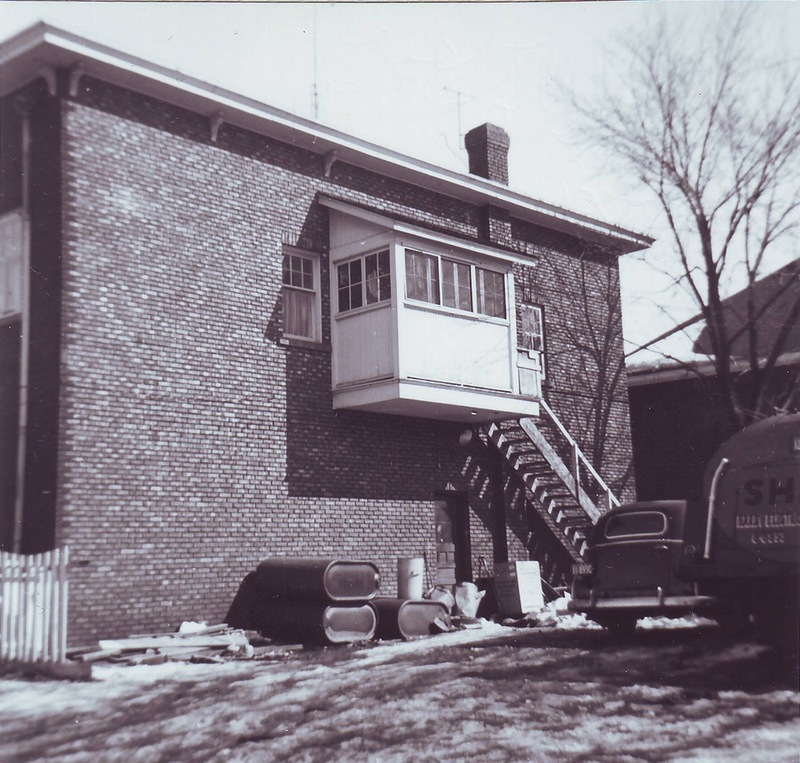 Construction of the big Elmdale addition continued throughout the winter of 1946-47. At the same time, the school board was also busy building W.E. Gowling school in Carlington. In June of 1947, the Board approved an expense of $485 for the removal of a large earth mound that had been a feature of the playground. The same month they also approved an extra expenditure of $1,400 so that the room partitions being built at Elmdale would be finished to the ceiling (a change from the original renovation plans). By the fall of 1947, there were six new classrooms in use, accommodating 300 new pupils. The final two classrooms and gymnasium were to be finished later that fall, but like the initial construction, the completion would drag on. The official opening would not take place until more than a full year later. During the final stages of Elmdale's big expansion, tenders were being accepted for construction of Fisher Park school down the street, the next big board project. 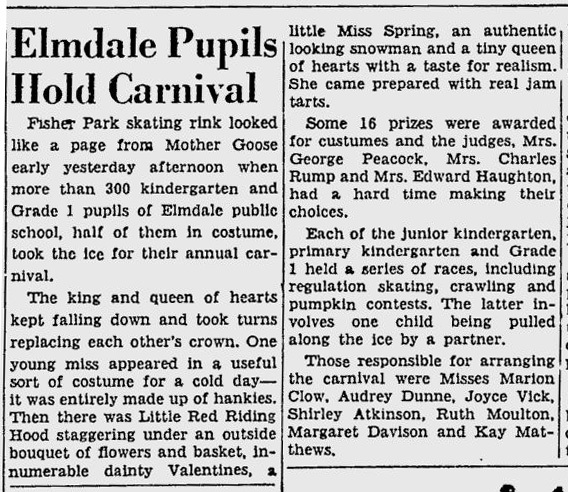 In November of 1947, principal G. Peacock of Elmdale had inquired into the possibility of a community skating rink being established on the school playground. 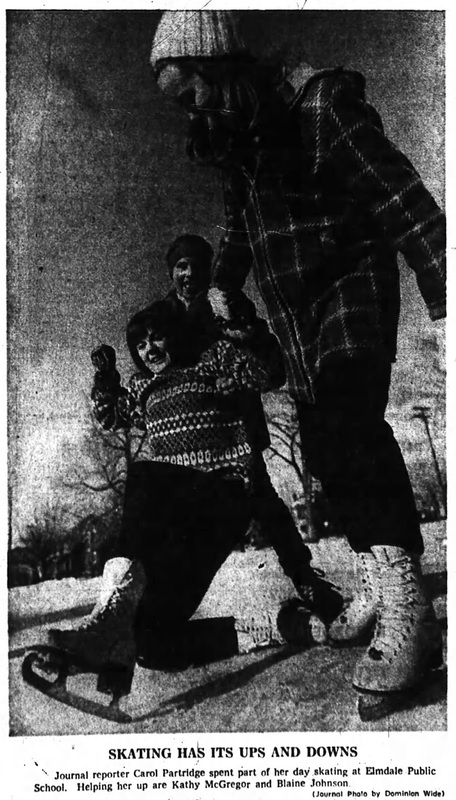 He took his request to the Ottawa Playgrounds Committee, who noted that the idea would be considered for the winter of 1948-49. 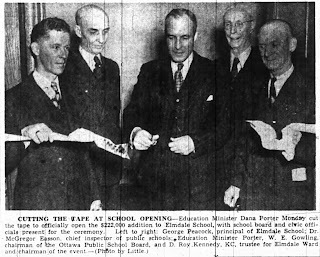 On Monday November 29th, 1948, provincial Education Minister Dana Porter was on hand to officially open the $222,000 addition to Elmdale School, in a ceremony held in the new gym and auditorium. The event drew a very large crowd of students, parents and local residents who packed the gym full. Rev. M. L. Orchard, chairman of the General Ministerial Association of Ottawa offered the invocation prayer, while a program of musical entertainment was given by the Elmdale School Choir. The choir, directed by W. Tweedy and accompanied by Harry Hill, sang 'Moon Song', 'Sunbeam Song' and a French folk song. The program also included violin selections by teacher William Amtmann and a group of his students, performing Christmas songs, barn dances, and classical pieces. A choir from York Street Public School was also present to sing 'Song My Paddle Sings' and 'The Voice of Canada'. D. Roy Kennedy made a lengthy address which told of the history of the school, and the advantages of the new school: "We have incorporated into the extensions the most modern improvements, lighting, project rooms, decoration and equipment, and this gym is the finest in our whole school system." He added that the school now had 685 students. The ceremony was commemorated by a plaque which was installed in the front entrance, supplied by the architectural firm of Balharrie Watson. 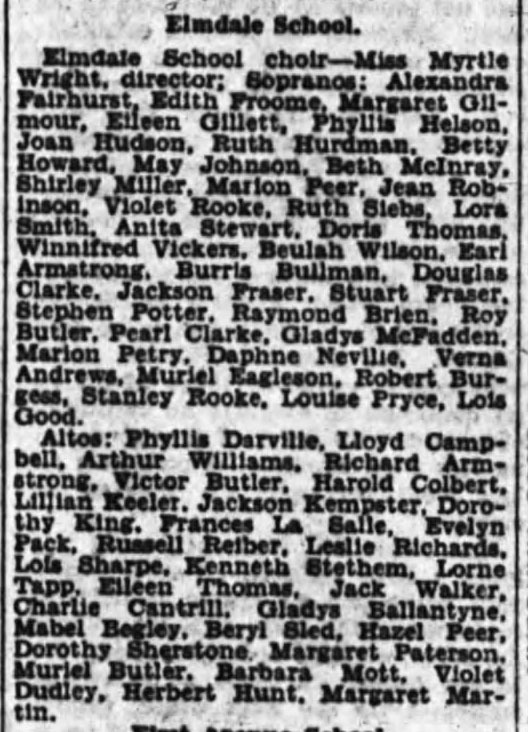 In January of 1949, Elmdale for the first time in its history honoured its graduates with a party. 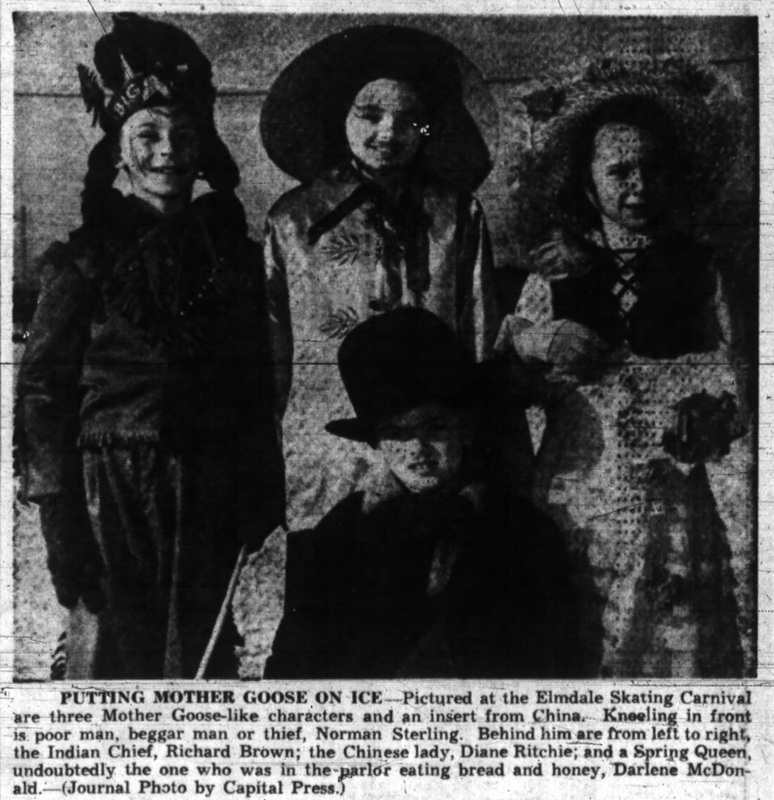 As reported by the newspaper: "They had passed the first milestone in their academic career and now in intermediate school, had the duty of maintaining Elmdale's proud reputation. The boys and girls heard a brief and informal address from school principal George Peacock. 'Regardless of what fields their careers might follow', Mr. Peacock said, 'they must make the best of their abilities and training. This was the spirit that Elmdale had taught them, and it was this spirit they must spread wherever they went.'" All graduates were presented with school crests, and the group watched a movie and held a party in the "basement playroom". 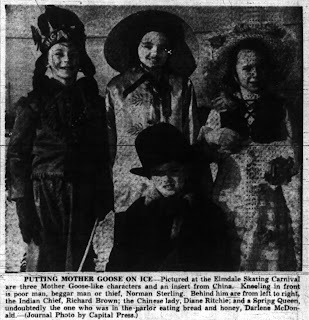 A young Norm Sterling (future long-time PC MP) was the star of the hit show at the Elmdale Carnival held on February 1st, 1950, "The Man in the Bowler Hat". The newspaper recounted that "Norman Sterling, seven-year-old grade two scholar won the 'funniest costume' prize for boys under eight and didn't realize it until the judge had lifted the bowler hat from its perch on Norman's ears and restored full vision to the little 'tramp'." 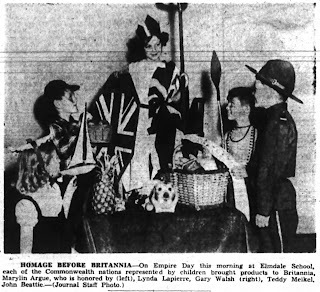 Empire Day (forerunner of Victoria Day) was an important day of celebration at Elmdale in 1950. The front page of the Journal featured a photo and write-up of the ceremony held at Elmdale in the auditorium/gym. "their young minds were trying to grasp the significance of the far-flung Empire sprawling its red ink over a quarter of the globe. The children learned of Victoria's reign, of how the Empire grew and developed in power over land and sea. They heard those mighty phrases 'King by the Grace of God, of the United Kingdom of Great Britain and Ireland, Defender of the Faith...'. Then to show how Britain, the mother, had built this great family of nations, the pupils of Grade 4 staged a tableau, depicting the nations of the Commonwealth as the children bringing their products for trade with Britannia. Through this the children were able to see the example the world has been given for modern living by the Empire. They learned of the duties and rights and liberties attendant upon a nation living in a large community of nations. They also learned of Canada's place and position, not only as the senior dominion, but as the linchpin between the Commonwealth and the United States." 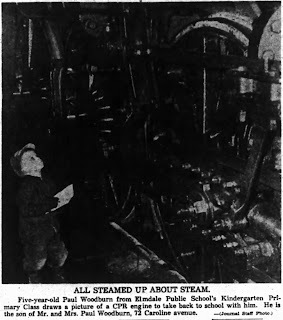 In February of 1952, the entire kindergarten class of Elmdale (numbering over 100 students) had an interesting field trip to tour the CPR roundhouse on Bayview Road, the climax of a project where they had been studying different modes of transportation through the ages. The students "visited the roundhouse to watch engines being cleaned up and repaired, and listened wide-eyed while N. H. Hay, CPR roundhouse superintendent explained exactly what made the big drive wheels go round. Then they went outside to the turntable where Mr. Hay whistled up a locomotive and had it turned around for them by the huge revolving wheel. Then they trotted along behind it to watch while it loaded up with fuel and took on water." Sounds pretty cool to me, I'm jealous! Photo below is of a presentation of a gift of new technology to Elmdale: an adding machine! Presented to principal D. A. Webster. Photo was dated May 11th, 1954. 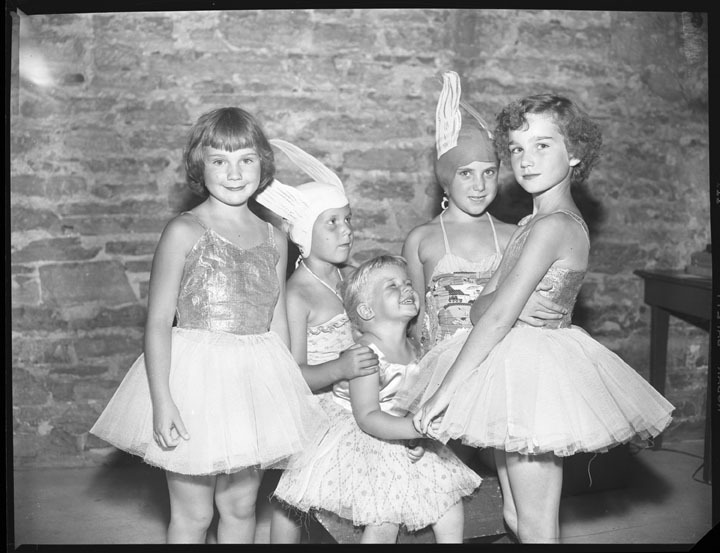 The photo below is from another event at Elmdale from 1955, which is on file at the City of Ottawa Archives. Not sure where in the building the photo was taken? Is there a stone foundation under the original part of the school? 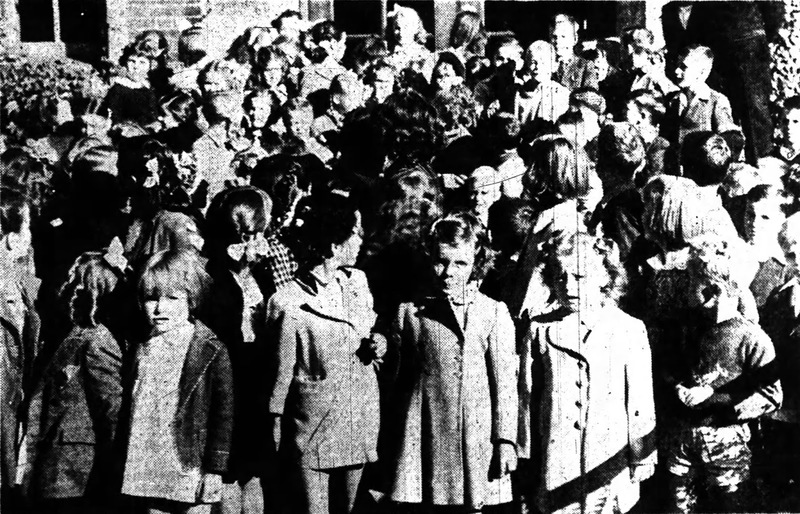 Elmdale students, fall of 1955. 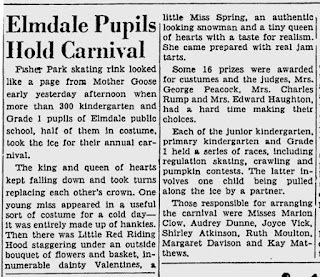 In the fall of 1965, Elmdale introduced a dress code of uniforms for girls, a uniform "available in most stores and priced reasonably". An article from 1967 added that "the reason that boys uniforms were not brought in at Elmdale is very simple. Parents that were contacted about a uniform for boys did not think it was necessary. They greatest problem they felt was a uniform for girls to do away with the competition on dress." The school uniform for girls-only was still in place in the fall of 1967, but was discontinued at some point. The French Immersion program was added at Elmdale during the early 1970s. The Library was a final addition for Elmdale. It was built over the winter of 1973-74 by WN Construction of Ottawa. Bookfest was first held in March of 1982, earning the school about $2,000 to be put towards books and teaching aids for the library, as well as learning materials for children with learning disabilities. I don't have the details on the 1982 or 1983 sales, but in 1984, Bookfest was held from 1:30 to 6 pm on Tuesday and 9 am to 9 pm Wednesday, in the gym. Book prices ran from 5 to 25 cents apiece. Elmdale reached its peak in student population, with over 700 students in the 1980s, which was when the portables began to arrive - Elmdale had two by 1985, and four more added during the 1990s (one more has been added in the last couple of years). The school population is now (according to the Elmdale website) just over 500 students. Since the 1980s, Elmdale has been featured in the news, but for different reasons. The school has escaped closure on a couple of occasions, perhaps never more closer than in 2000. In May, the Board released an options list of 24 closure scenarios to address a surplus of 6,000 student spaces within the Greenbelt. At a board meeting in late August, the nine recommended closures were announced, which was further reduced to six soon after. Elmdale was one of the schools on the lists, slated to close in September of 2001 (Devonshire was also in this group). A major "Save Our Schools" campaign was run in our community, and the parent council was never more active in fighting the closure. It's almost painful to go over the bad memories of 2000 again, but to cover it briefly, it was argued that outdated demographic data was used, and a questionable funding formula which dictated that the Board must close schools until the overall enrollment reaches 100 per cent across the board. Furthermore, by not eliminating space the province deemed surplus, the board would forfeit funds required for new construction required in suburbs. Keep in mind as well that 2000 was the year of municipal amalgamation, when urban vs. rural infrastructure funding issues came to the forefront. It was also two years after the merger of the Ottawa and Carleton boards, and there were still many internal issues tied to that. Elmdale was the victim in all of this, despite Elmdale being at 115% capacity. Happily, in December of 2000, the board announced at a late-night meeting, they decided to keep open all but one of the six schools originally slated to close. Elmdale was saved, temporarily. The topic was left simmering over the next couple of years until May of 2003, when closures again were being implemented, as the Board expressed a need to close schools in the Ottawa West region. Eight proposals were presented, four of which included closing Elmdale and splitting the student population among four other schools. Thankfully, Elmdale survived that round of closures as well. The school has also occasionally made headlines over heat issues, particularly in the portables. In one 1995 article, the temperature was measured at 33.3 degrees inside a classroom. The board even closed all schools one day in 1994 due to the heat. I'm sure this is a problem that continues on for students today on the hottest days. I definitely have memories of sitting in scorching hot classrooms in June. And who can forget the Hooters fiasco from 2002, when a flip-flop on the acceptance of contributions from the infamous restaurant resulted in a colourful debate that made headlines across the city. Hooters had been approached to contribute to the Elmdale Fun Fair by way of a loan of BBQs. They were unable to do that, and instead offered to donate $250. Many parents were angry, and the school council was divided on what to do. Hooters withdrew their offer to put an end to the fiasco. So there you have it - the detailed history of Elmdale School. A great school that so many take great pride in. The school seems to have been well maintained and preserved over the years (as opposed to most of Broadview, which is apparently well overdue to be demolished), and though you never know what the school board may come up with, it seems like Elmdale's future is safe and solid for the next generation or two at least - and hopefully many more than that. Elmdale is the perfect microcosm of the neighbourhood. People feel attached to it, and have a pride associated to it that you may not see in a lot of other schools or communities. 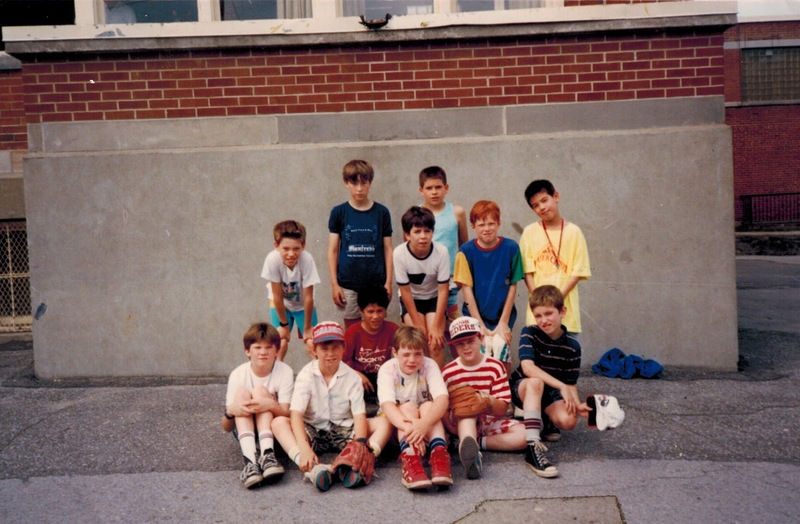 Most of the friends I made at Elmdale in the mid-1980's I still maintain today. Even our hockey team of friends that we play on today has its core dating all the way back to our games in the schoolyard of Elmdale. And I don't think I'm unique in that experience. I'm happy that Elmdale lives on today, and proud that my kids can attend and have the exceptional school experience that I and thousands like me have had over the last 88 years and counting! top row middle in the white shirt.